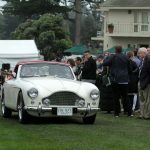 During the 2017 Pebble Beach Concours d’Elegance I ran into this exceptional 1949 Healey Silverstone which was in the post-war preservation class. 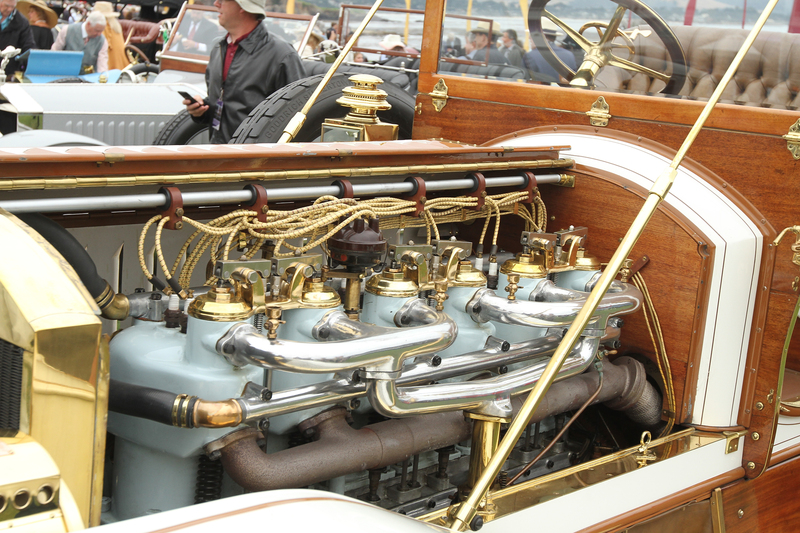 Looking at this car, this certainly has to be one of the most original Healeys in the world; even retaining its original radiator hoses that look like they could blow at any time. 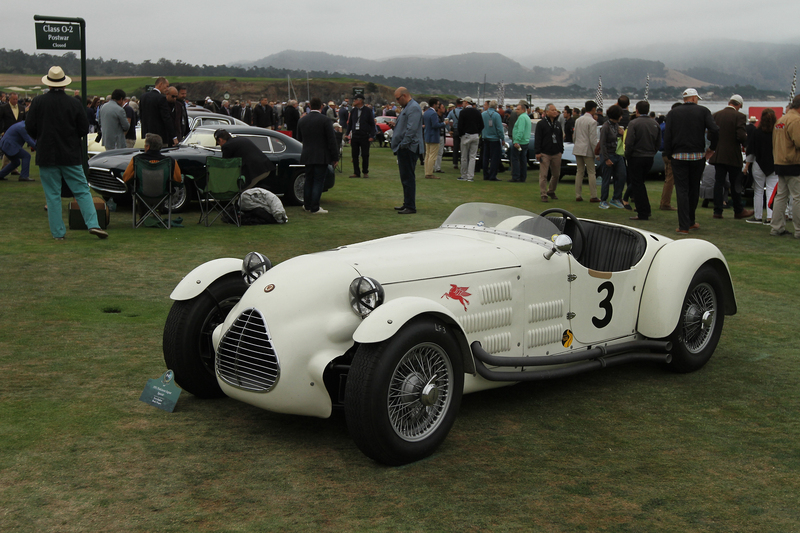 As mentioned in the Video this is car number 3 of about 100 made. 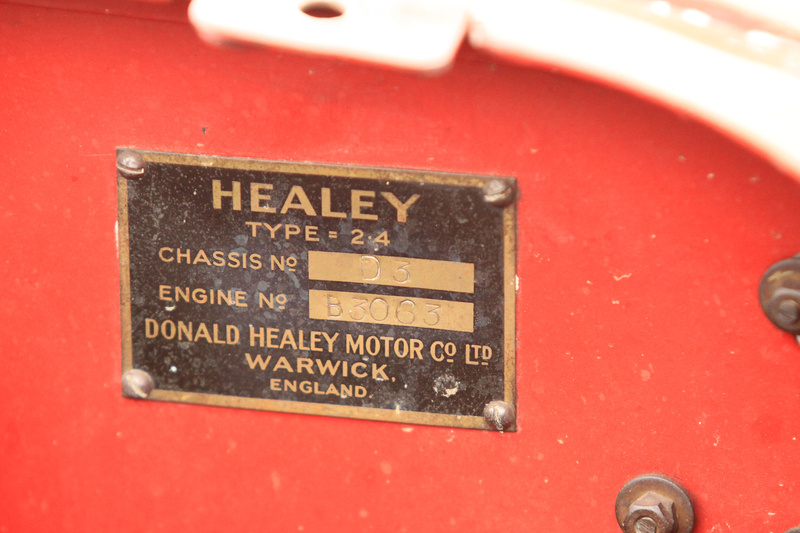 This is Donald Healey’s first real production sports car. 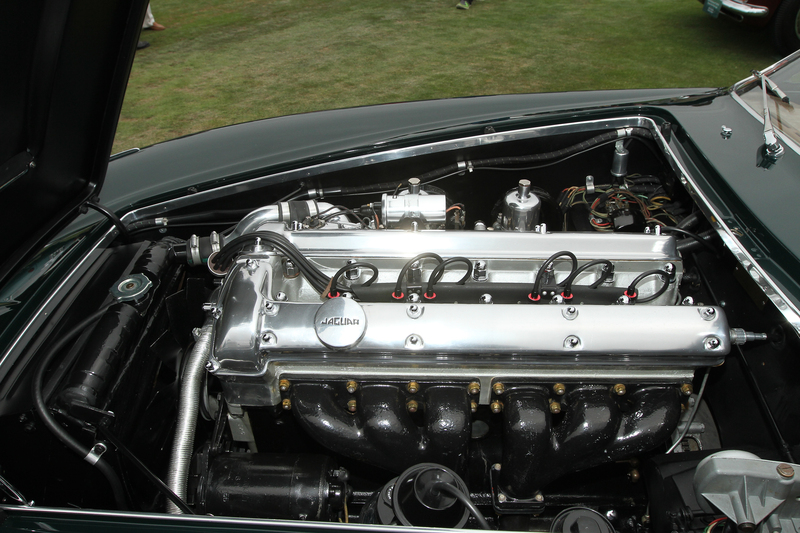 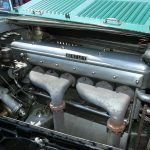 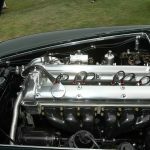 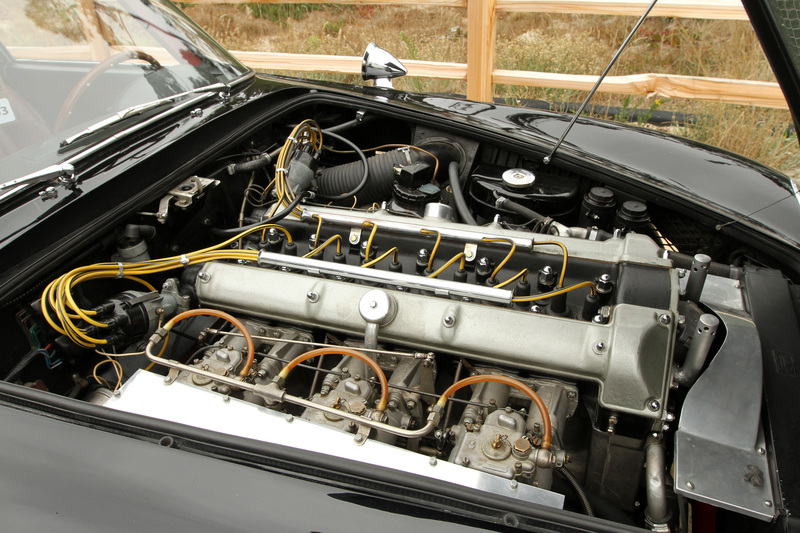 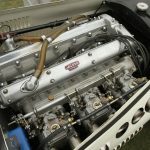 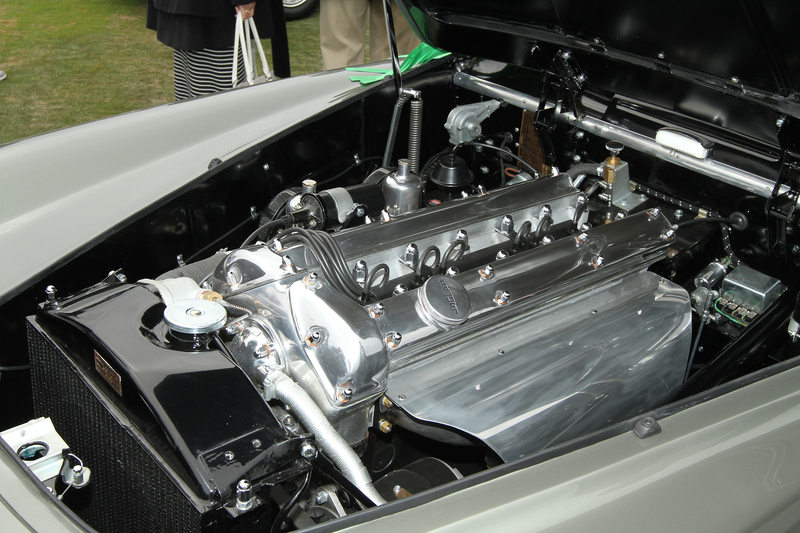 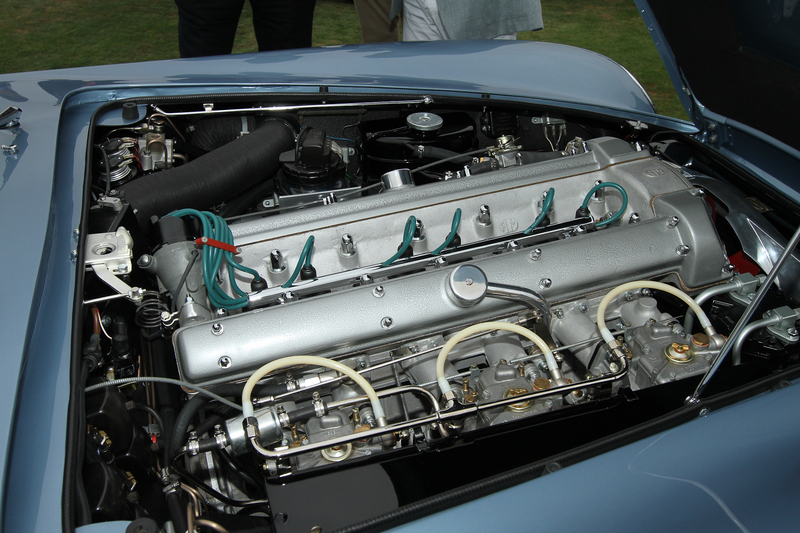 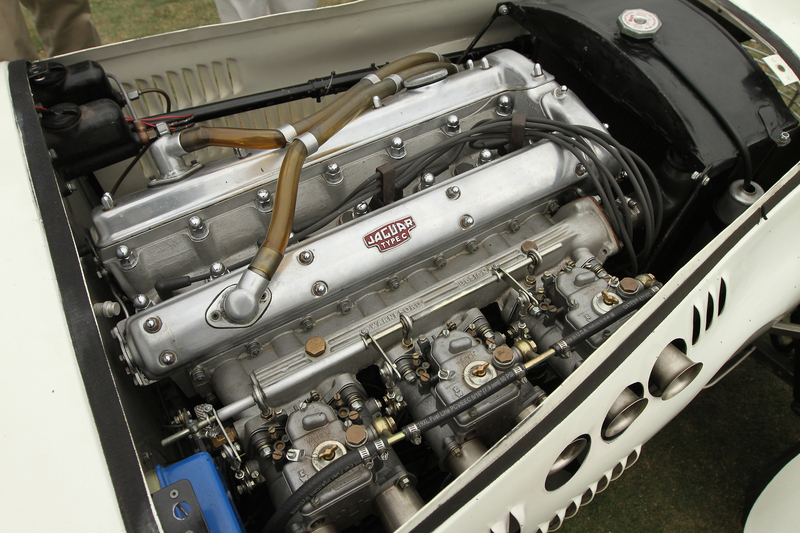 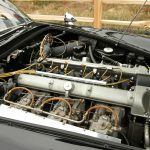 About 100 silverstones were made with the Riley-engined D-type 2.4-liter engine. 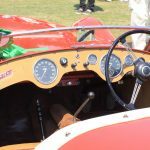 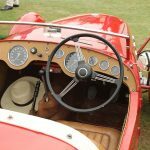 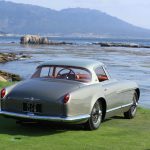 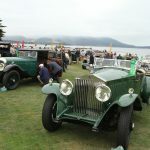 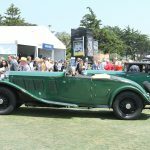 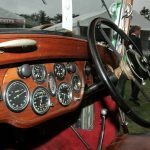 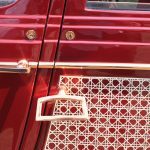 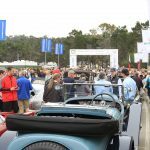 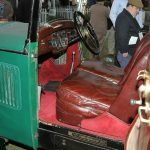 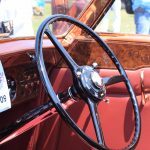 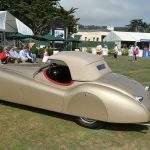 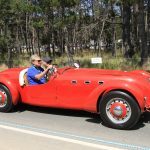 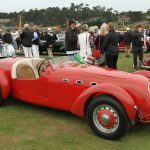 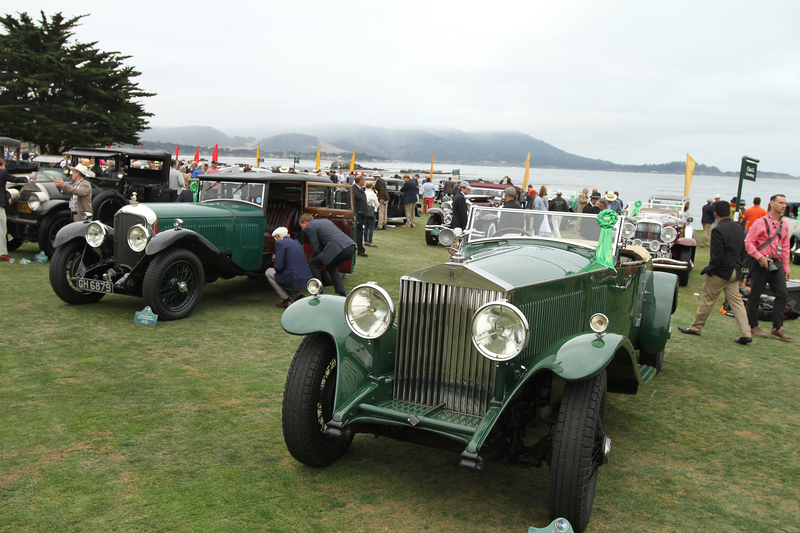 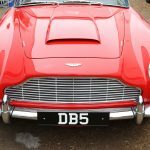 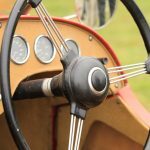 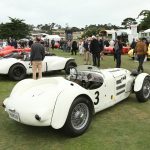 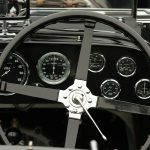 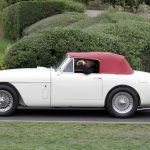 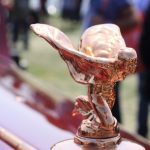 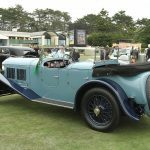 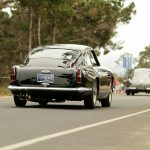 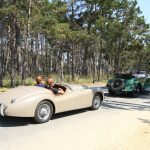 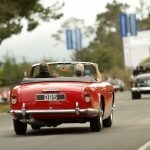 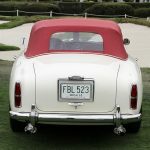 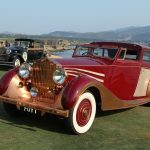 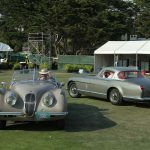 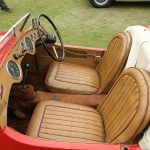 Here is a great selection of the British cars from the best car show in the world, the 2017 Pebble Beach d’Elegance. 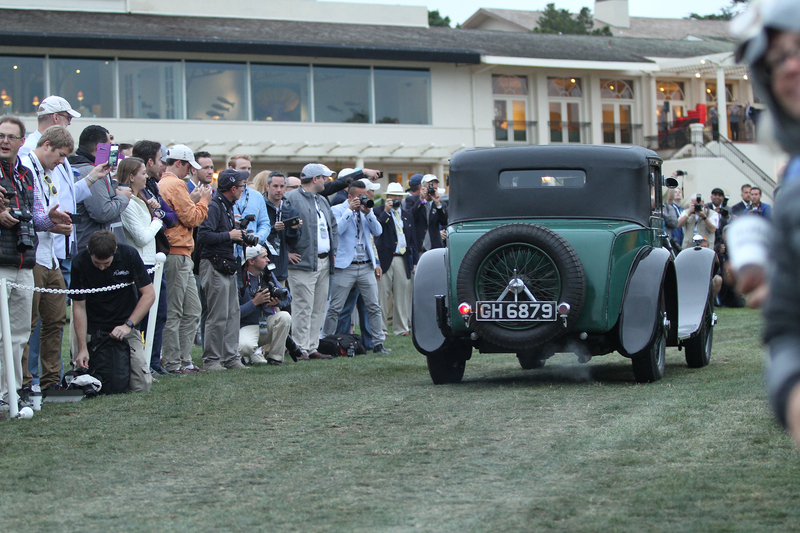 We start with my VLOG of the event which has several of the sights and sounds from PB. 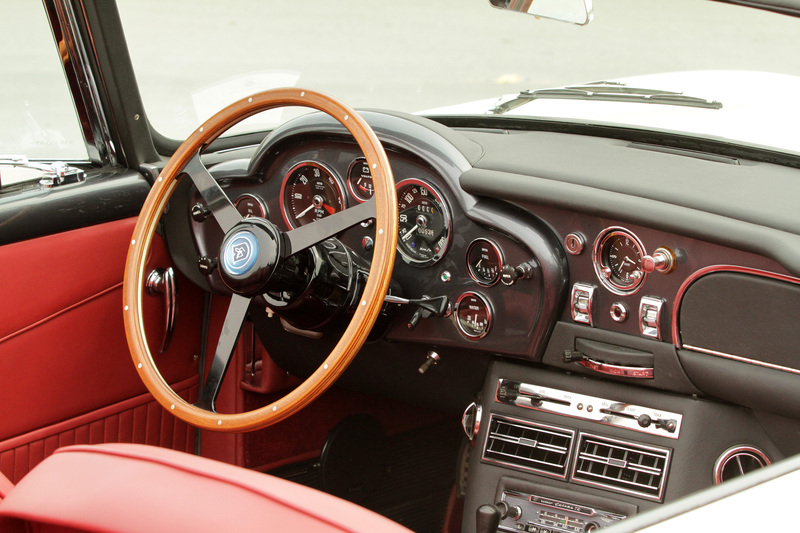 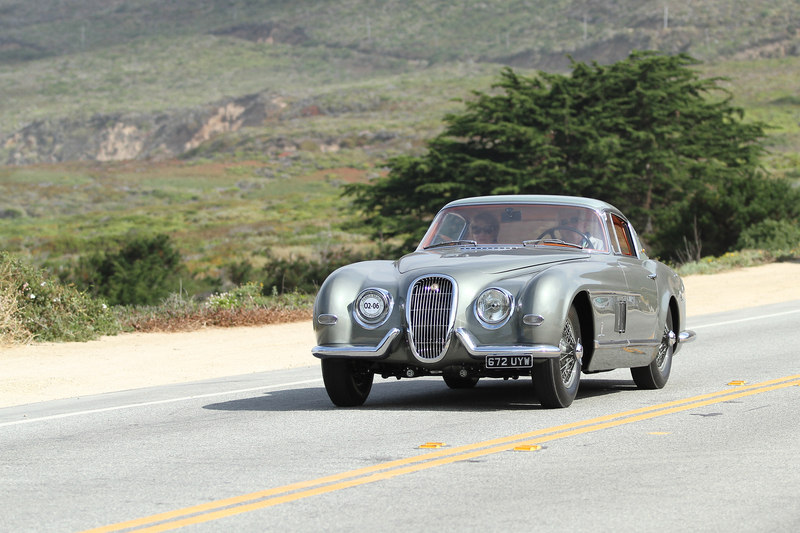 This unique coachbuilt Jaguar XK120 was shown at the 1955 Turin Motor Show before being sent to Max Hoffman in New York who had ordered it for an important client. 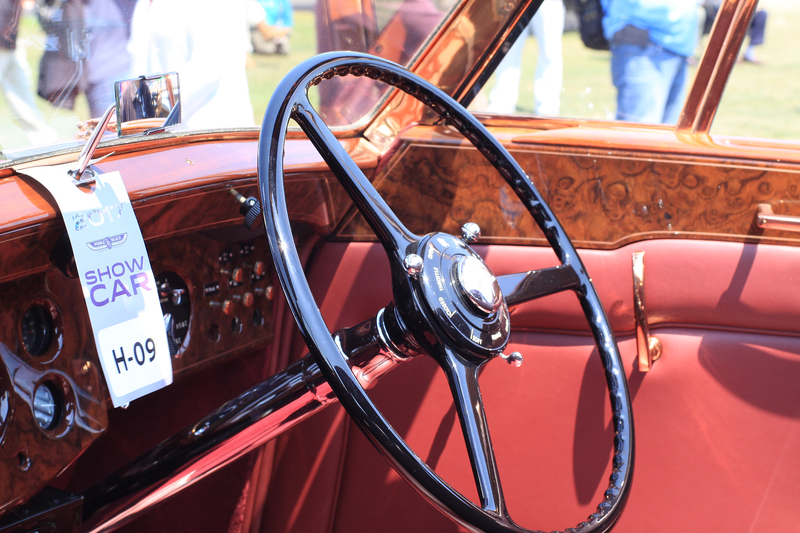 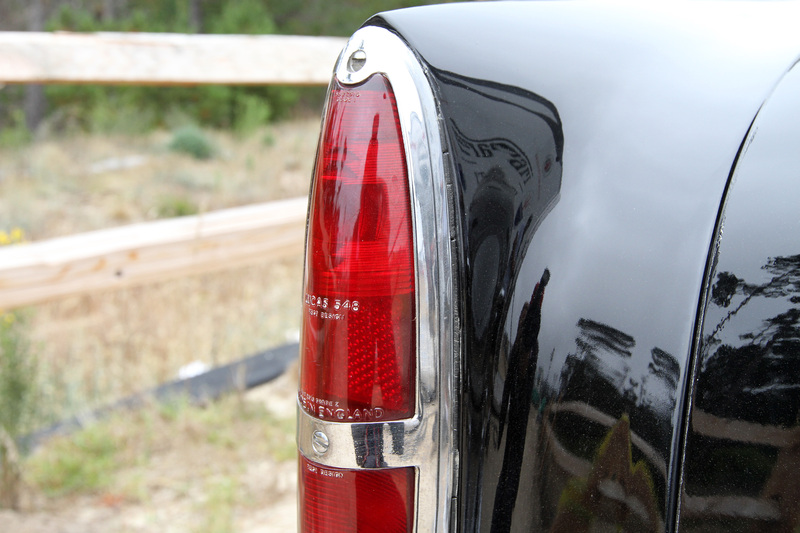 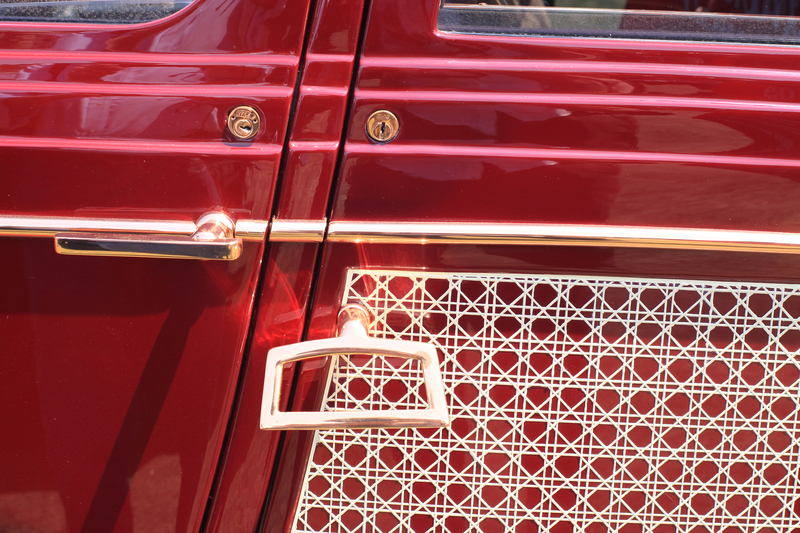 Hoffman was the importer of many luxury European automobiles during the 1950s. 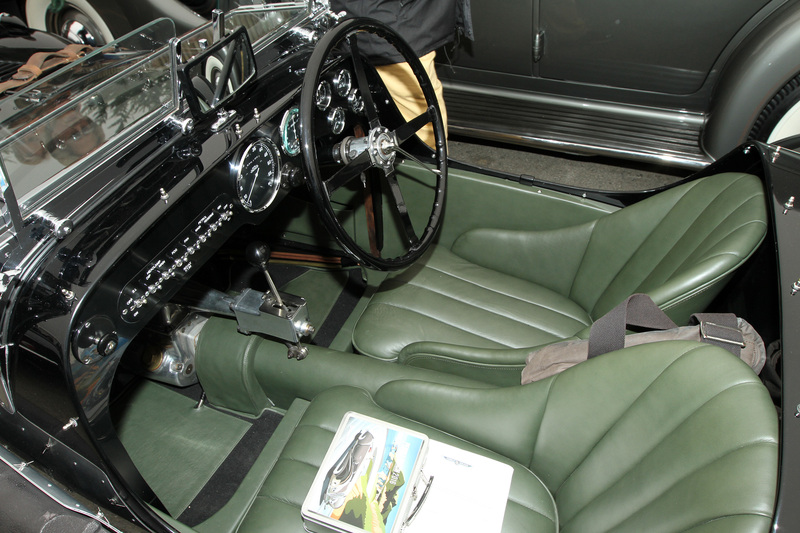 He inspired the production of two significant vehicles, namely the MercedesBenz 300SL Roadster and the BMW 507. 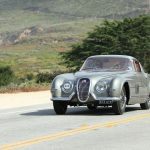 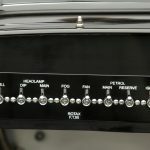 He also brought the first ever XK120 into the United States, and he personally worked with Battista Farina on this unique design to reinterpret the groundbreaking Jaguar. 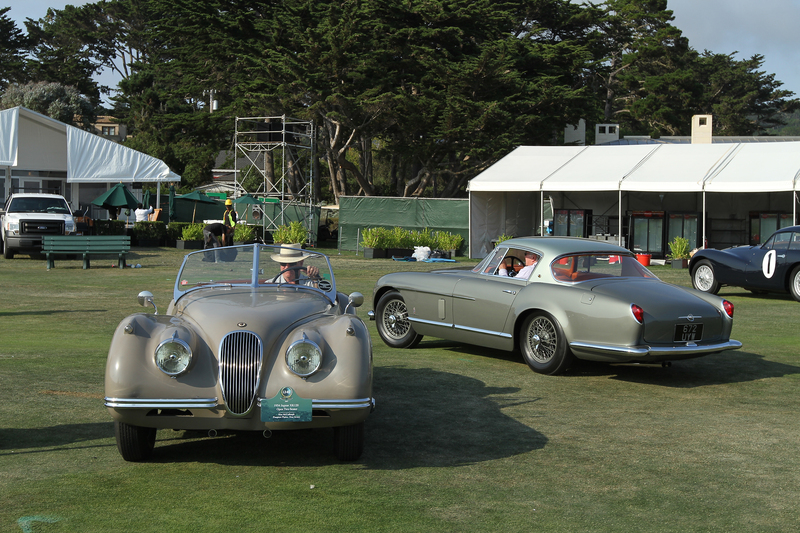 Only one of these cars was built by Pinin Farina although several other Jaguar XKs were bodied by other Italian carrozzerie. 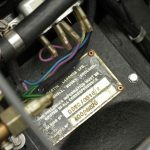 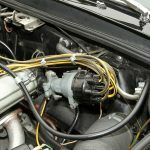 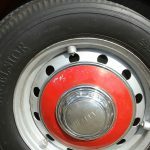 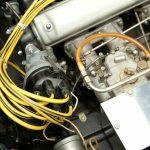 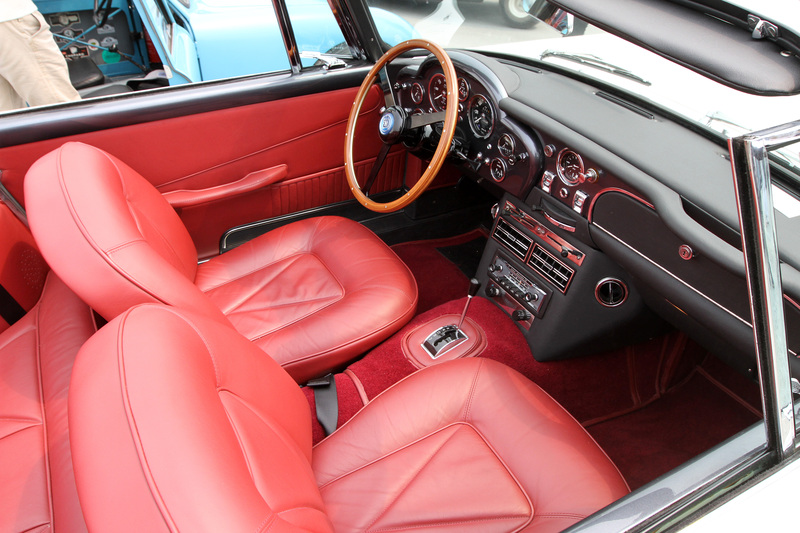 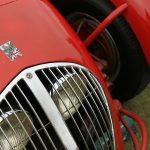 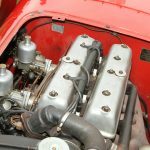 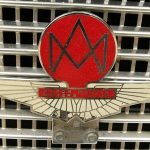 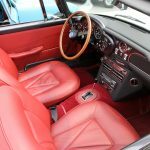 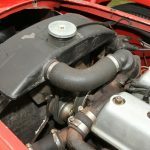 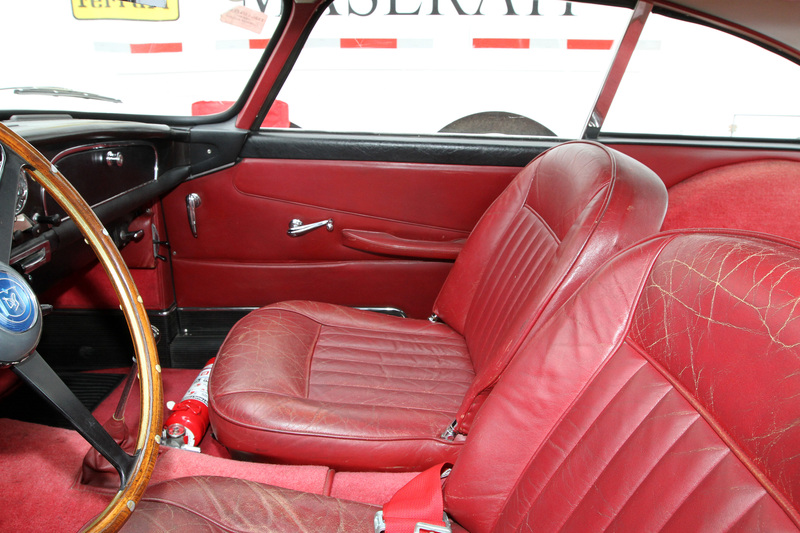 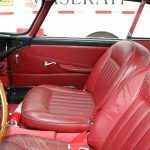 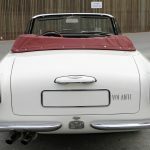 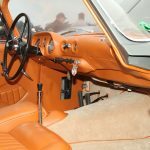 The early history of this car is not known, but it resided in Germany between 1979 and 2015, when its current owner acquired it and began to restore it. 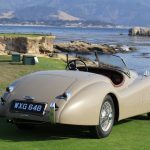 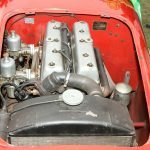 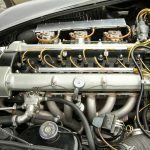 1954 Jaguar XK120 SE Pinin Farina Coup? 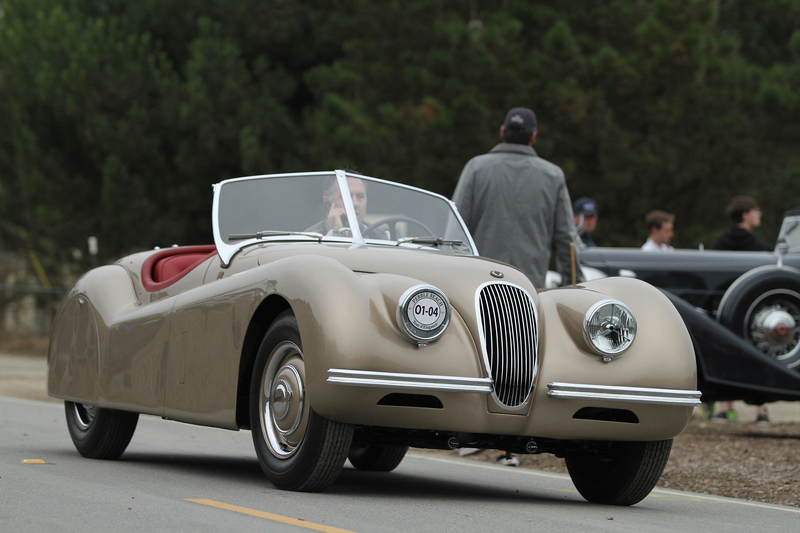 The Jaguar XK140 was introduced at the 1954 Earl’s Court Motor Show in London. 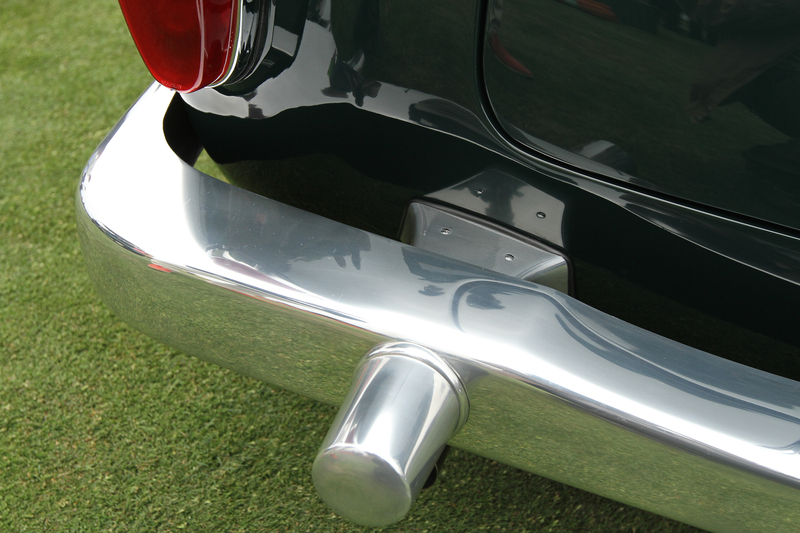 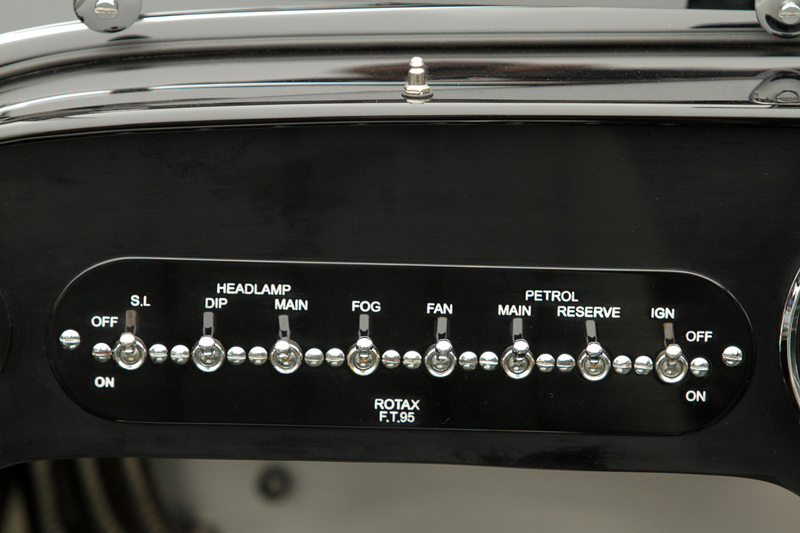 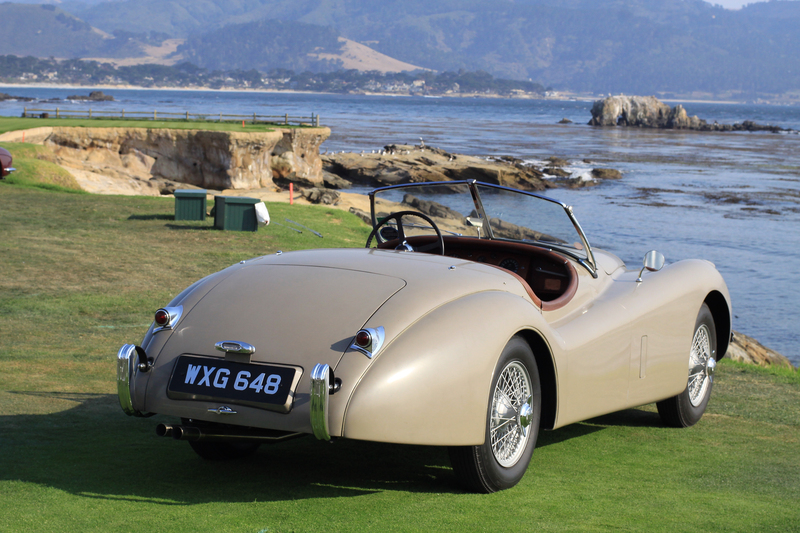 For the XK140, slight modifications were made to the original XK120, including more substantial front and rear bumpers with overriders and flashing turn signals. 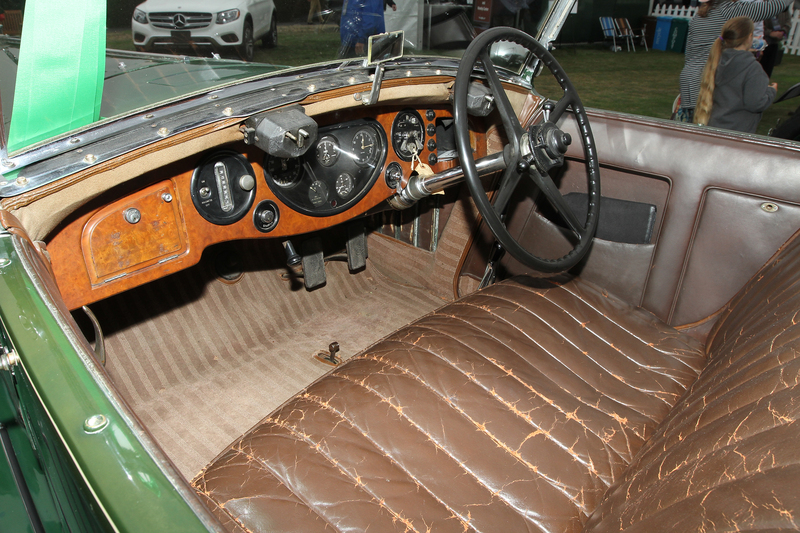 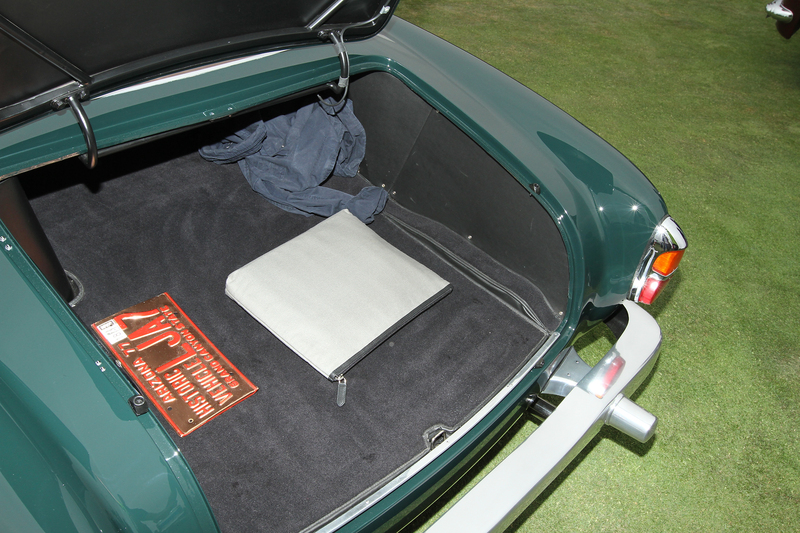 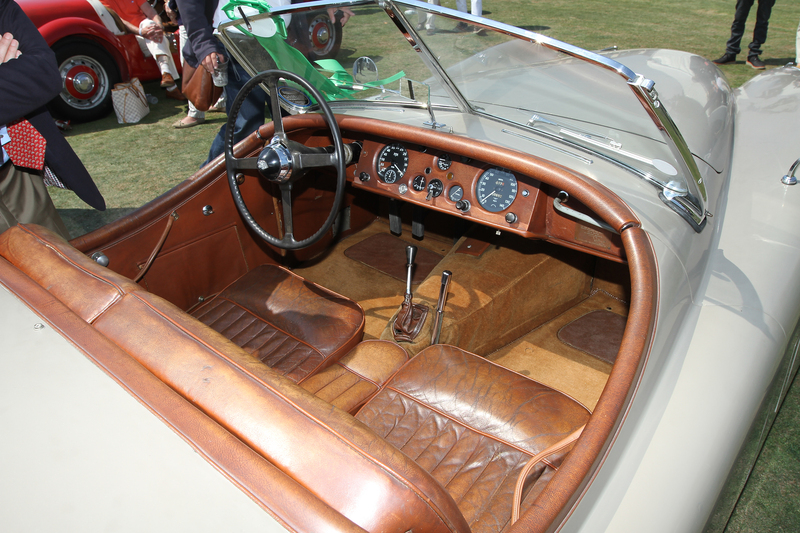 As with the XK120, a few of the coachbuilders of the day designed their own coachwork on the XK140. 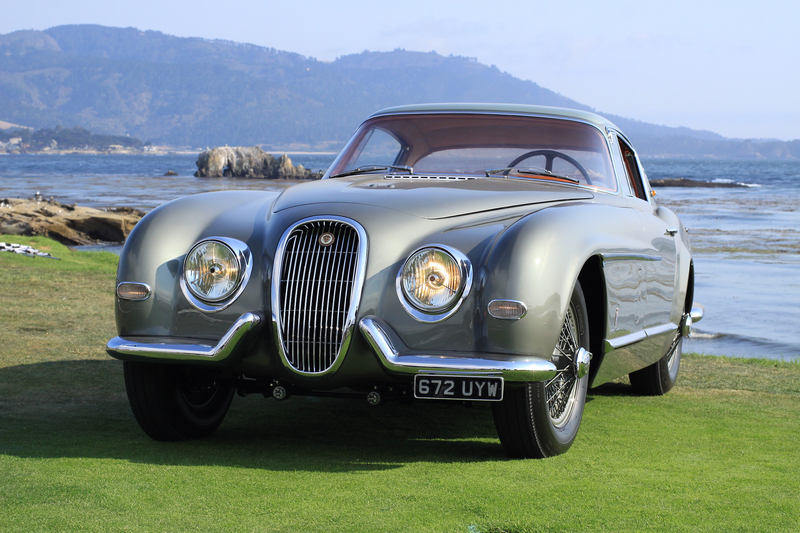 Guido Modiano commissioned Zagato to build this coupé body for his Jaguar XK140 after the car’s original body was badly damaged in an accident. 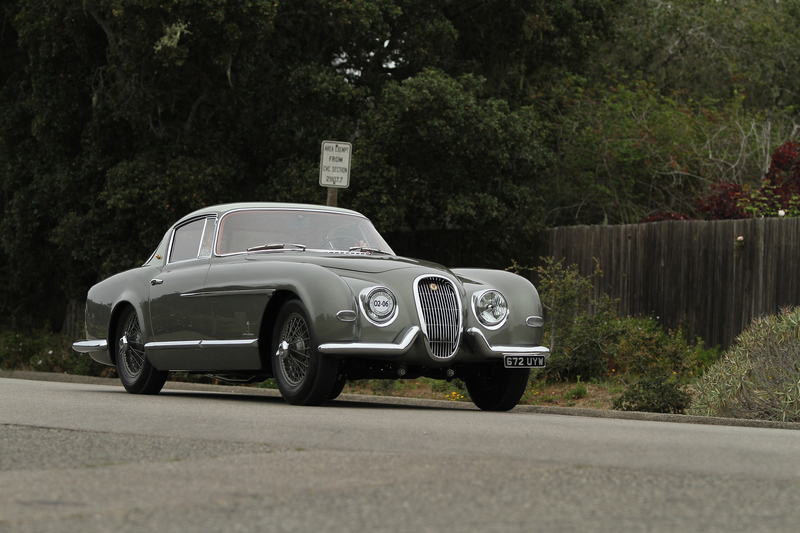 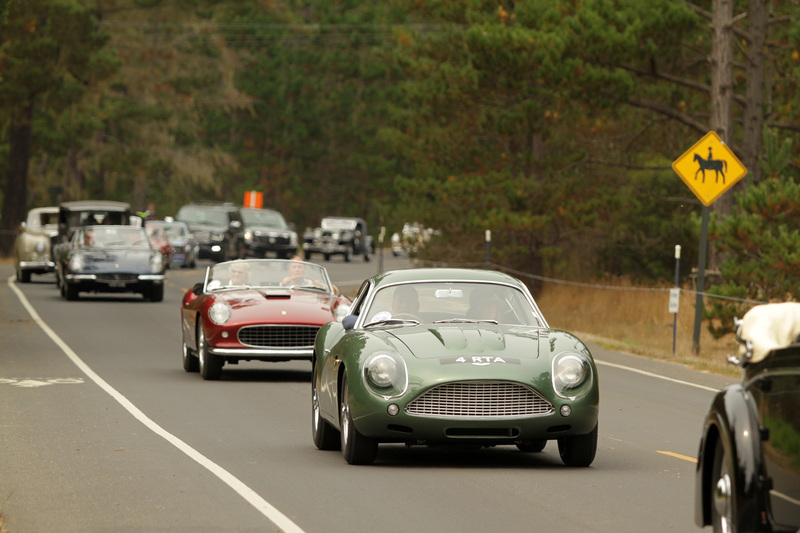 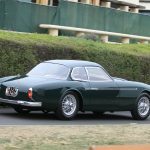 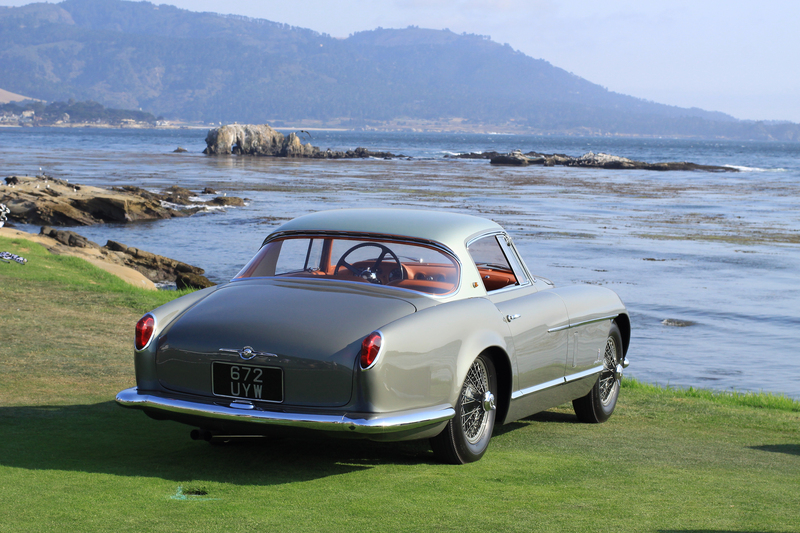 Upon its completion, Zagato showed the car on its stand at the 1957 Paris Auto Salon. 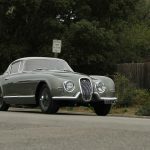 Plans were made for Zagato to body several more Jaguars, but it is believed that he only completed one more, on an XK150 chassis. 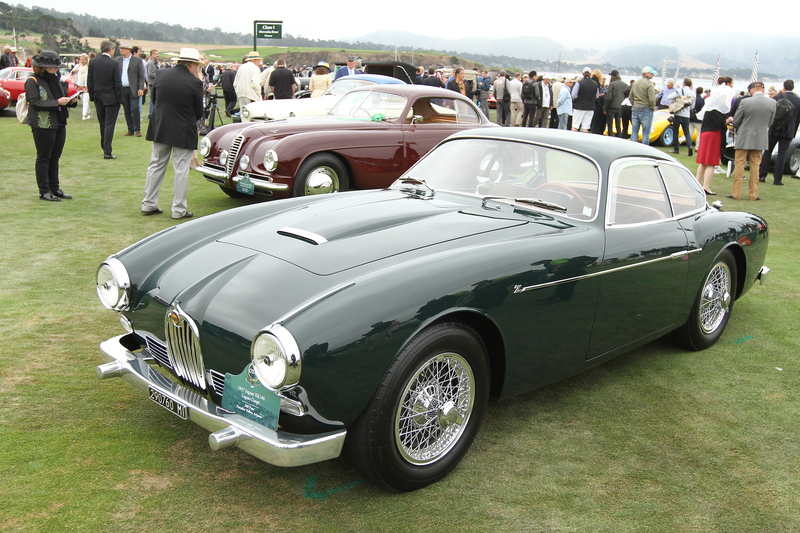 1957 Jaguar XK140 Zagato Coup? 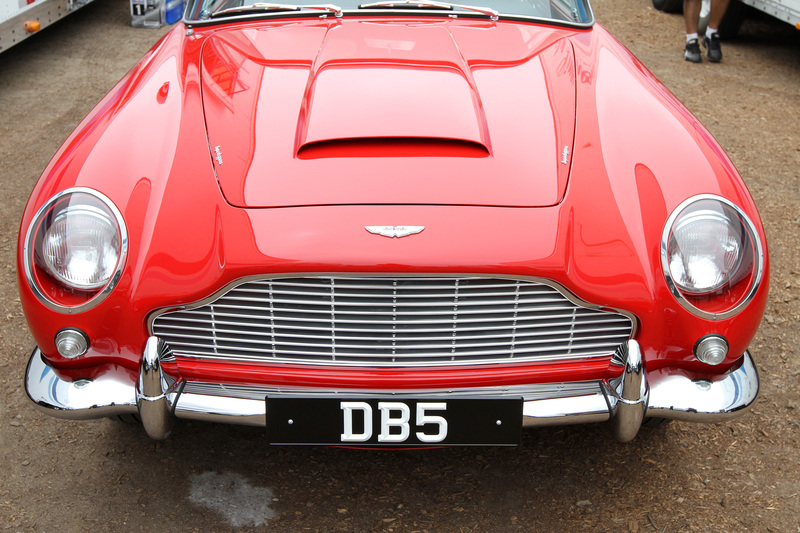 Martin DB6, launched a few months after this car was completed. 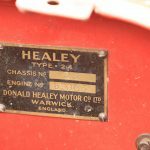 Healey sold 105 Silverstones over 1950 and this car was the third to be built. 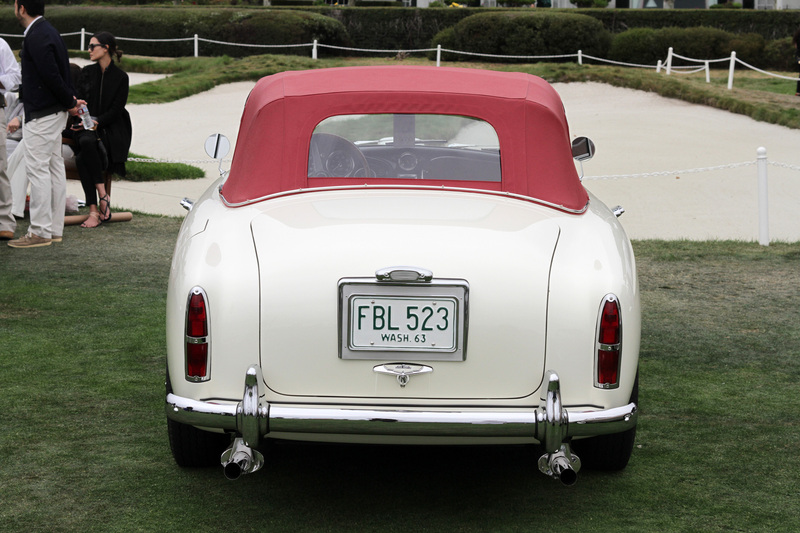 It was delivered to Francis Robinson of Newport, Rhode Island. 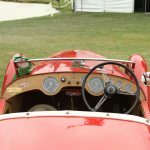 He is listed as entering this car in the 1950 SCCA Watkins Glen Grand Prix alongside Briggs Cunningham, who drove his own Silverstone. 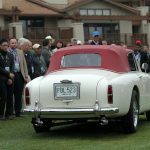 This is thought to be the most original Healey Silverstone in the world; most of the others have been upgraded and modified for racing. 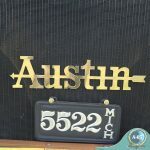 Walter Austin founded the Austin Automobile Company in 1903 in Grand Rapids, Michigan, two years before Herbert Austin founded what came to be the better known Austin Motor Company in England. 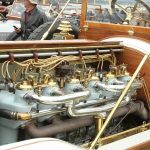 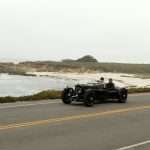 Walter Austin’s first vehicle was a big twin-cylinder motorcar on a 90-inch wheelbase, and his cars became more powerful every year. 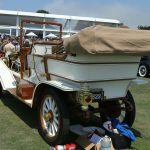 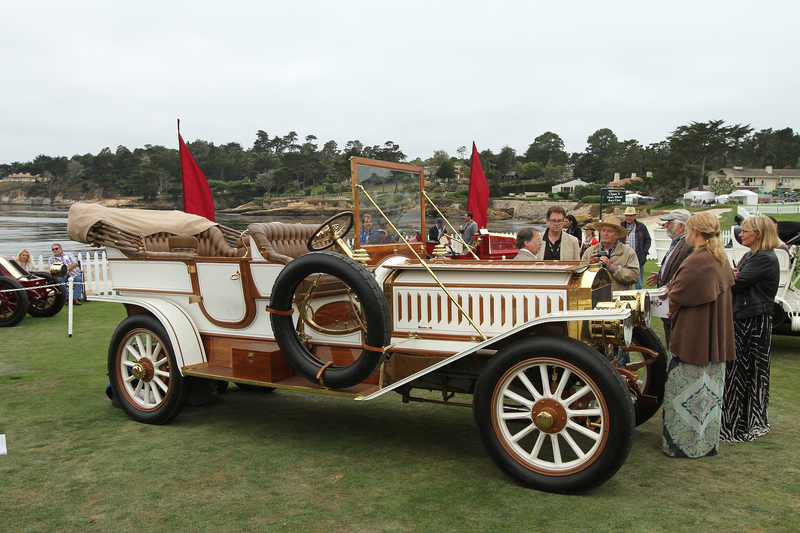 His company produced a total of 575 cars from 1903 to 1920, and owners included William Randolph Hearst and the boxer Jack Johnson. 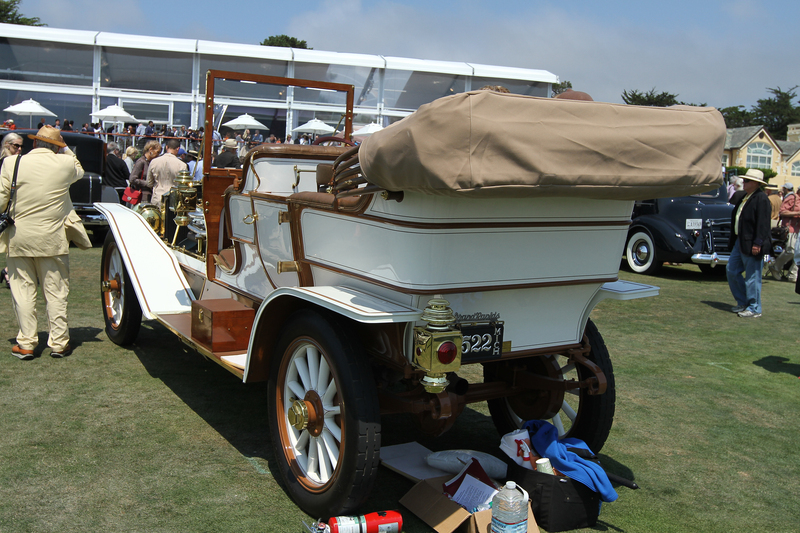 This Model 60 was first displayed at the 1909 Chicago Auto Show and was sold for $5,000 to Charles Herbst of Lima, Ohio. 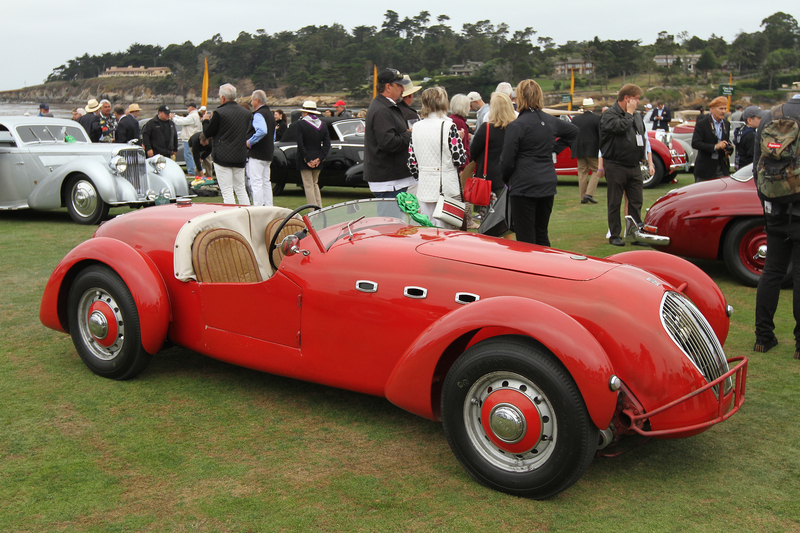 The Herbst family sold the car in 1946 to Barney Pollard, a vintage car collector. 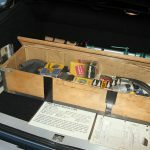 It was later displayed at the Crawford Museum in Cleveland, Ohio, for 30 years. 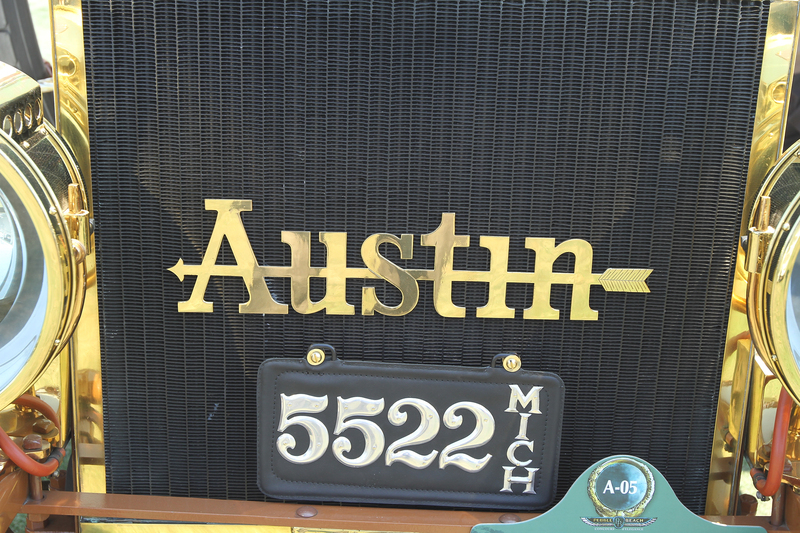 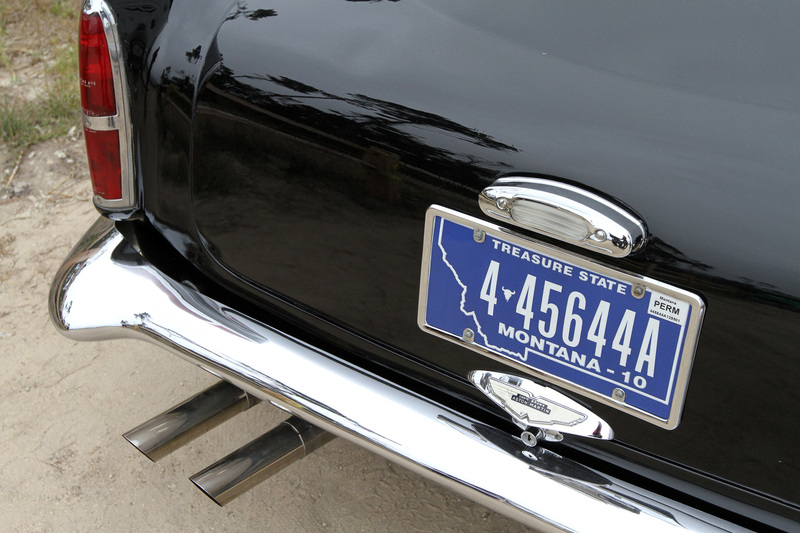 Never completely dismantled, this very original Brass Era car was restored in 2003.
and smoothing the boot line by removing the recessed license plate holder. 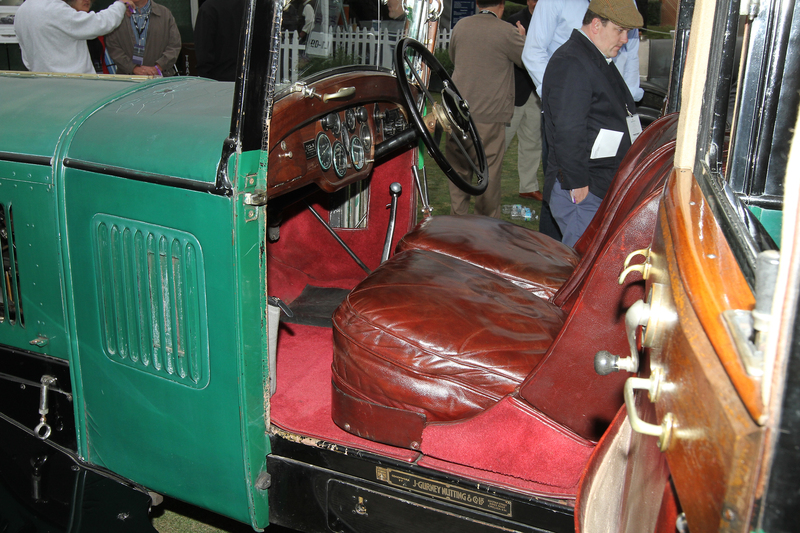 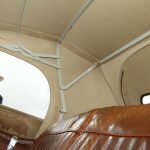 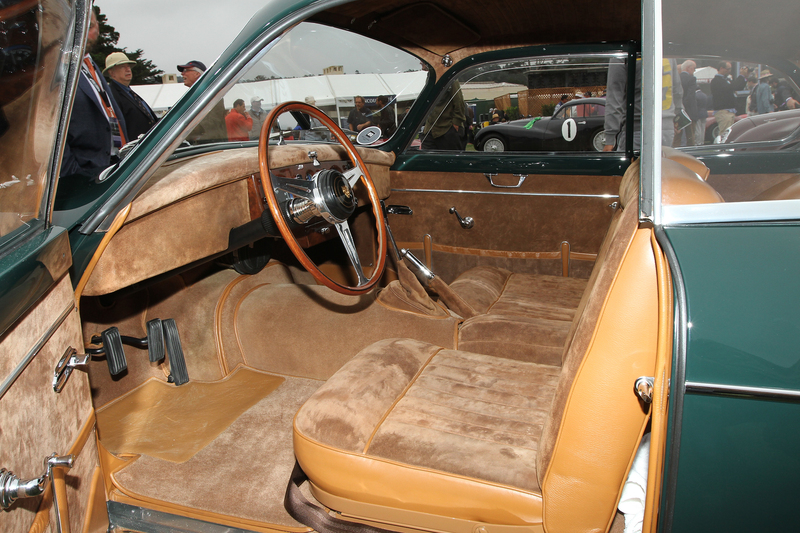 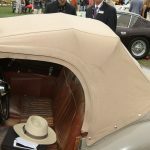 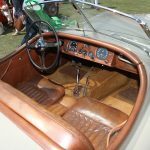 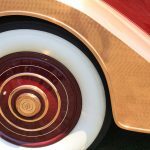 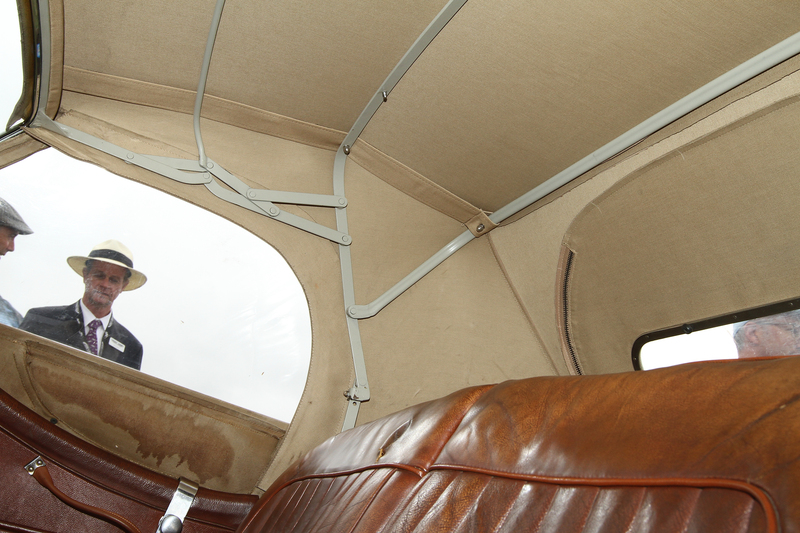 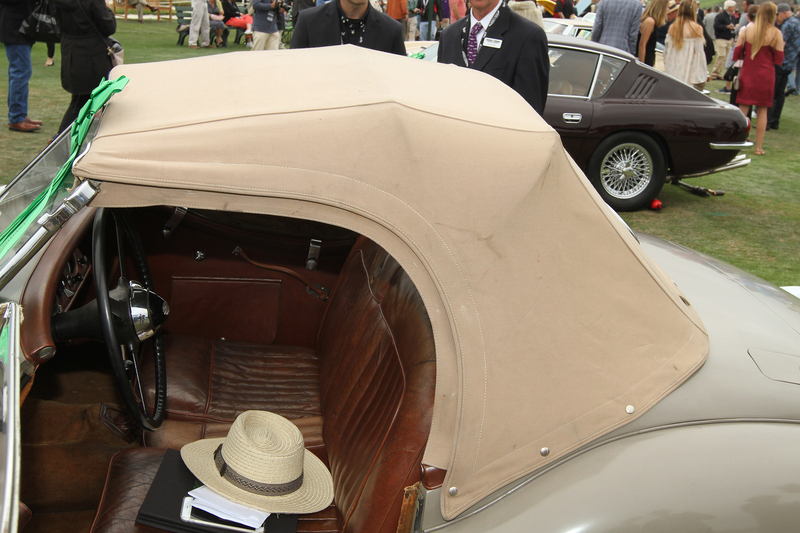 The car was then finished in Barris Gold Bronze Lacquer and a special Carson-type padded top was fitted in order to give Gable more headroom. 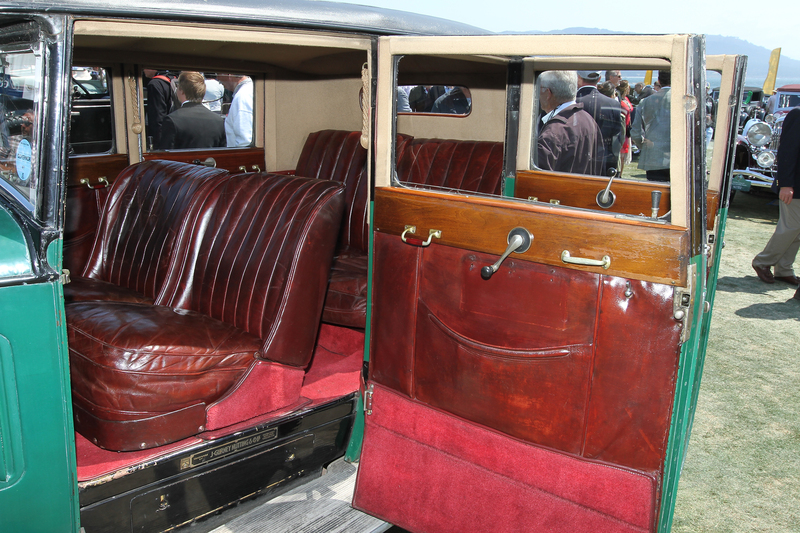 The current owners found it in 2009 and had it restored in 2014. 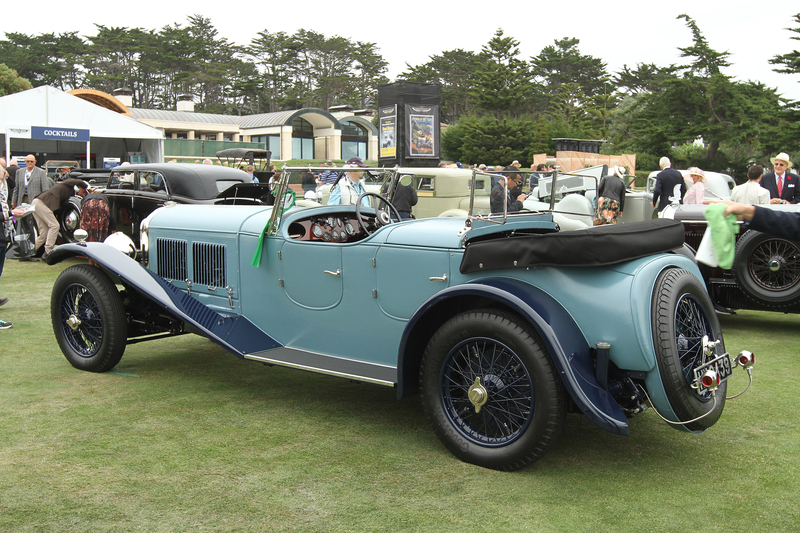 Bentley built this car for Sir Egbert Cadbury, a member of the Cadbury chocolate family who had served as a pilot in World War I and shot down two Zeppelins on their way to bomb London. 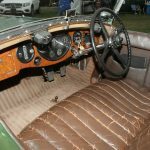 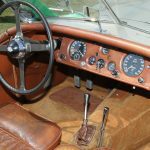 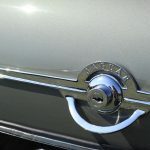 He kept the car until 1954, but after a time, he had its original Mulliner saloon body replaced with this Vanden Plas “bobtail” coachwork from another Speed Six. 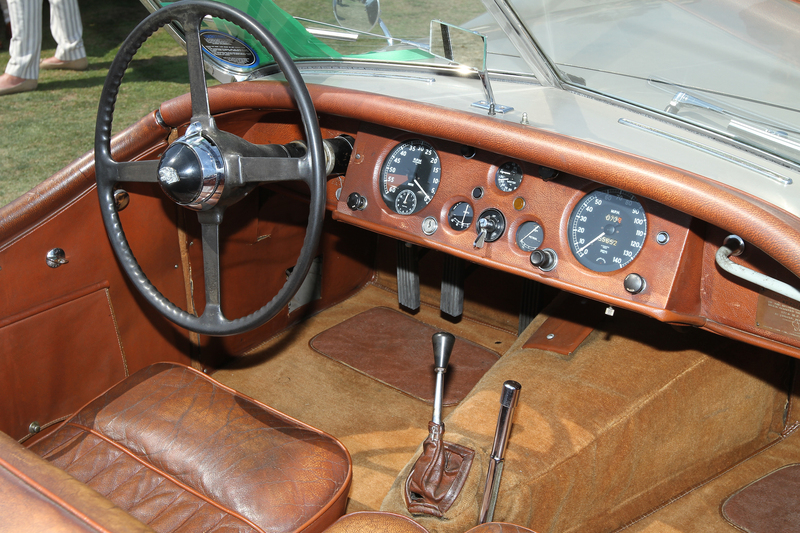 Only four of these distinctive bodies were made by Vanden Plas and three survive. 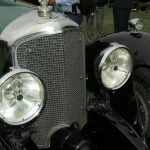 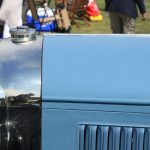 The first was built on a 4½ Litre chassis for the Le Mans Bentley Boy, Bertie Kensington Moir, and was used as a demonstrator at his Bentley dealership. 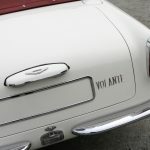 This special Bentley has recently been restored with “new” Rexine fabric made to the exact specification of the original Vanden Plas body. 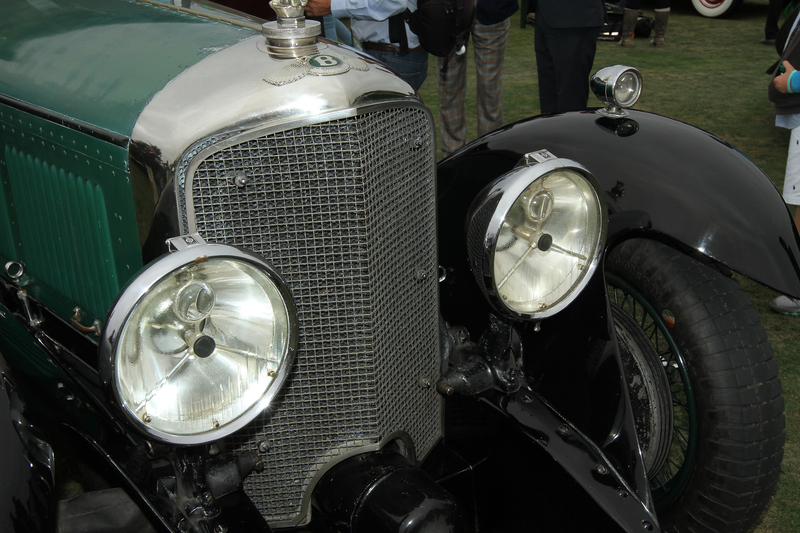 This 1930 Bentley Speed Six (chassis NH2741) bodied by Gurney Nutting was sold to its first owner through the Bentley dealership of Kensington Moir & Straker Ltd. of London. 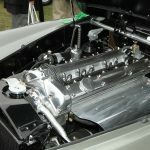 Gurney Nutting bodied 46 Speed Six chassis in total, almost a quarter of the 182 Speed Six that were built by Bentley Motors, but only four Speed Sixes exist today with their original Weymann sports saloon bodies and this is the only Speed Six that retains its original Gurney Nutting coachwork. 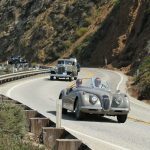 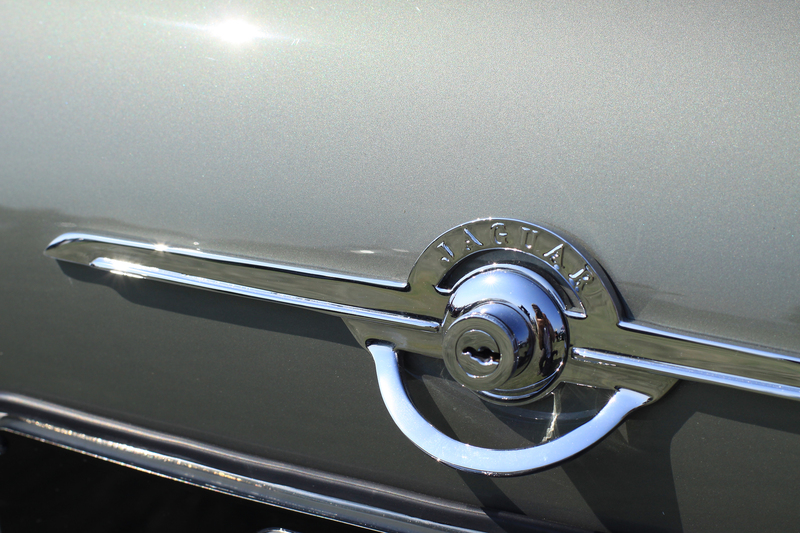 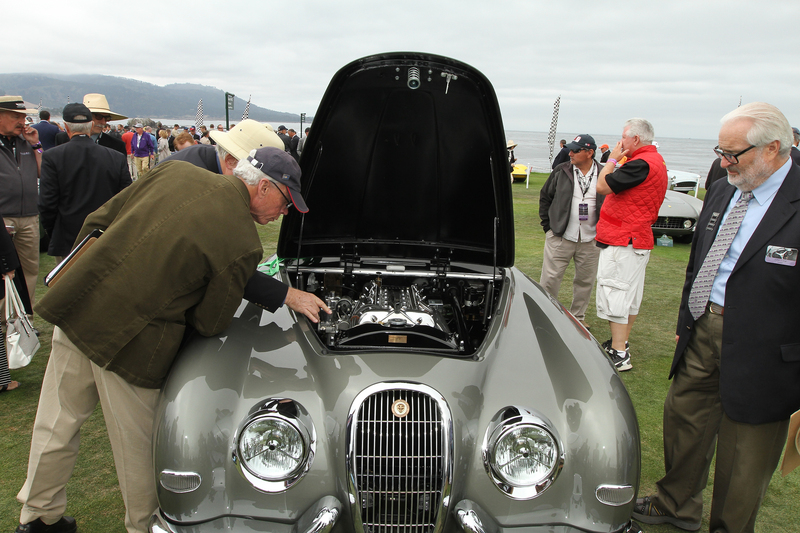 The Parkinson Jaguar was originally an aluminum-bodied Jaguar XK120 Roadster, one of the first of the new Jaguar sports cars to arrive in California. 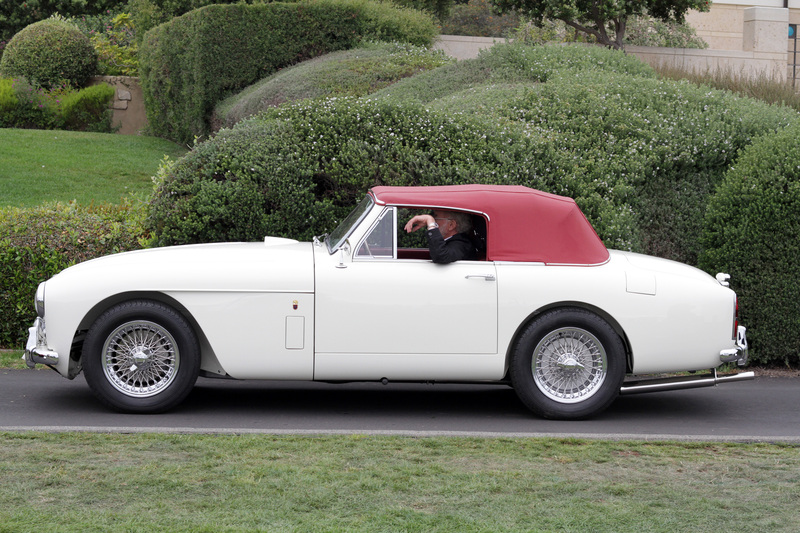 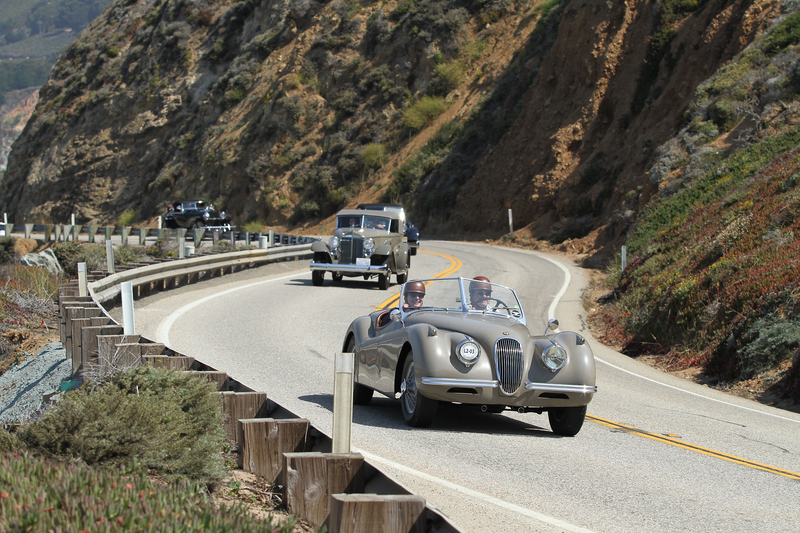 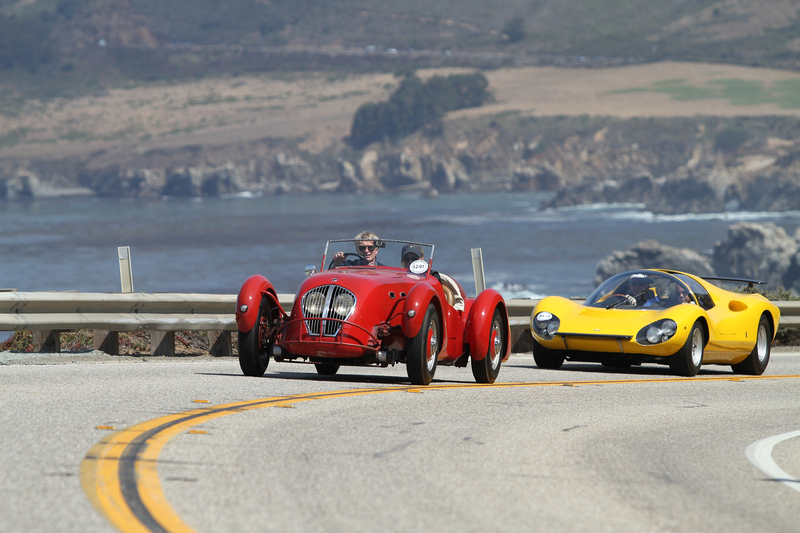 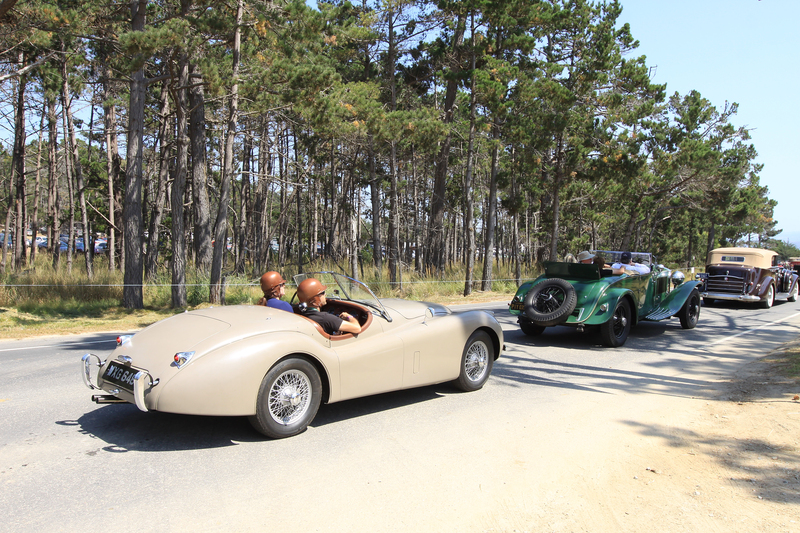 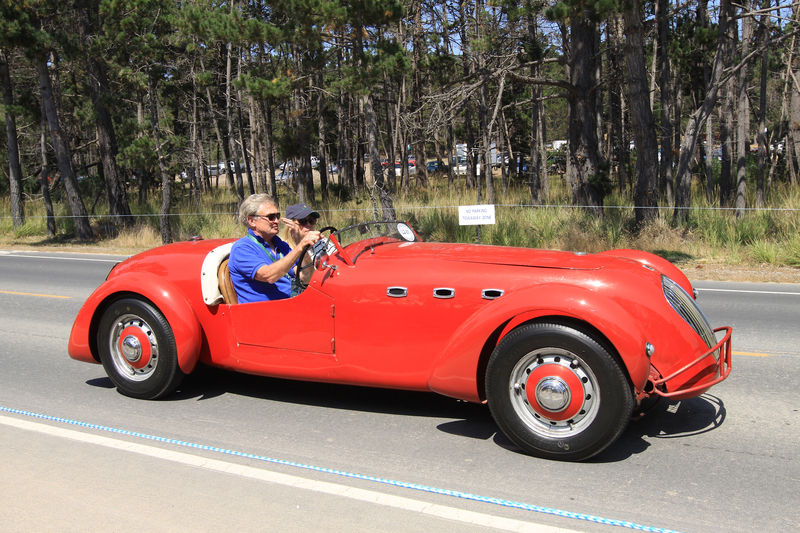 Don Parkinson drove the XK120 to Pebble Beach for the 1950 Concours and raced it in the inaugural Pebble Beach Road Races, finishing second in the Pebble Beach Cup. 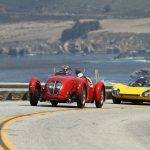 Returning to the forest in May 1951, he lost control on Turn 1 and rolled the car, and the remains of the wrecked Roadster became this Special, which was built by Joe Thrall, Parkinson, and Phil Hill (Parkinson’s brotherin-law) at odger Barlow’s International Motors in Los Angeles. 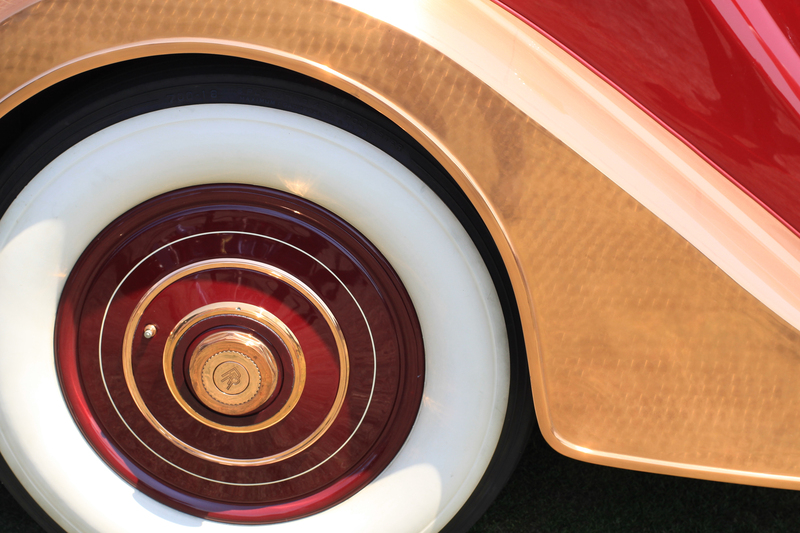 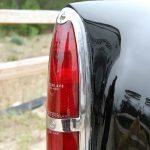 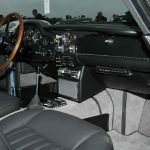 The aluminum body was sketched by teenager Robert Cumberford, who later became a General Motors designer and styling critic, and it was built by Marvin Faw. 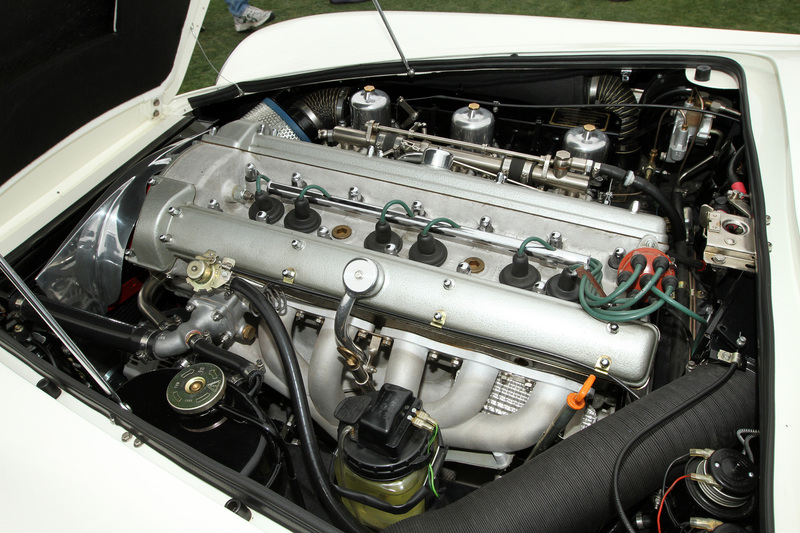 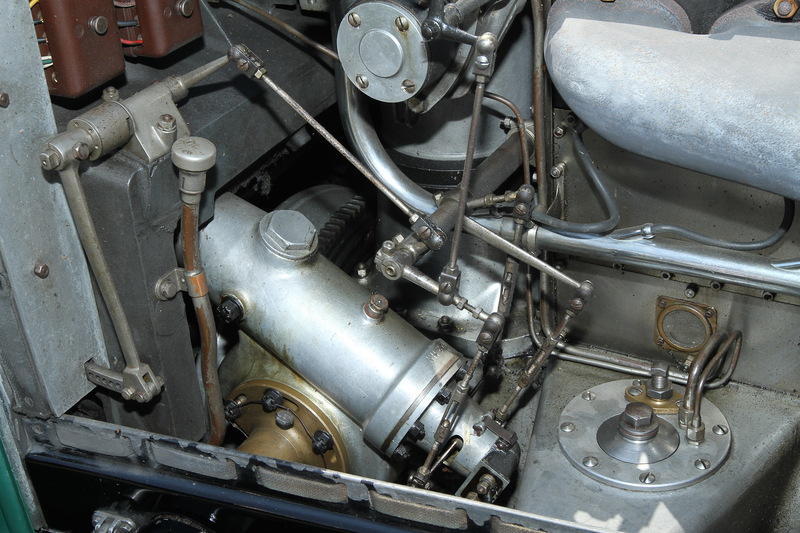 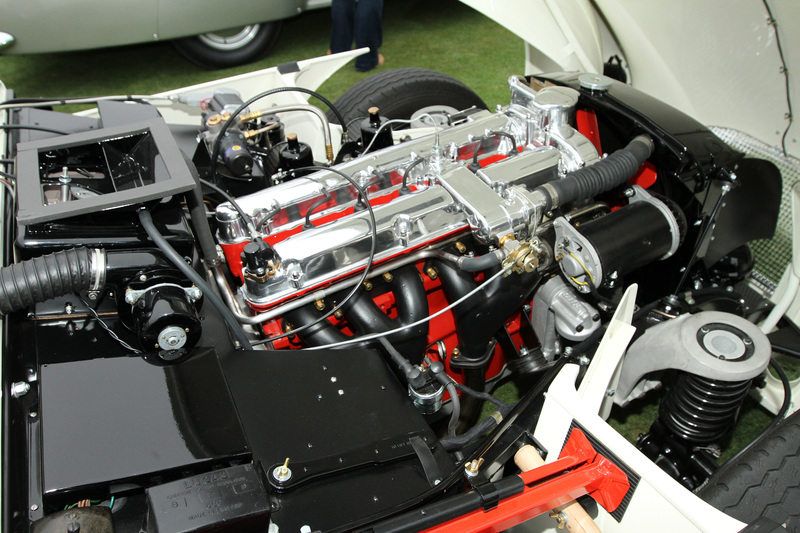 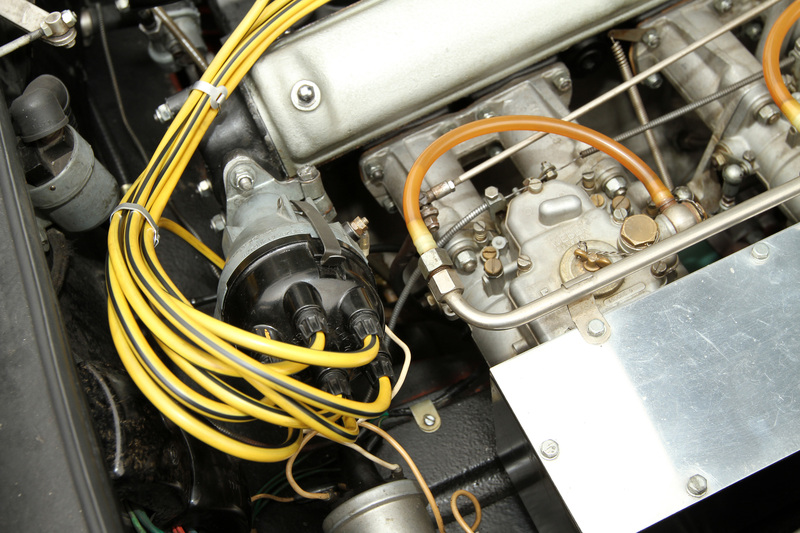 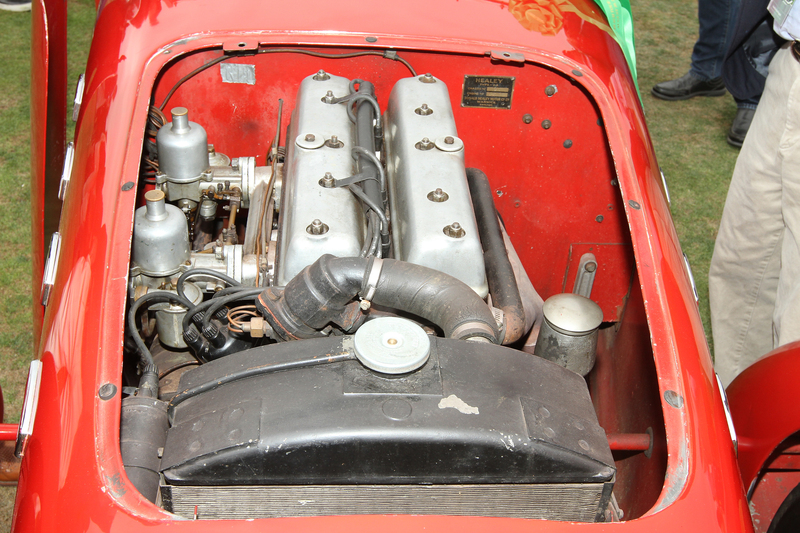 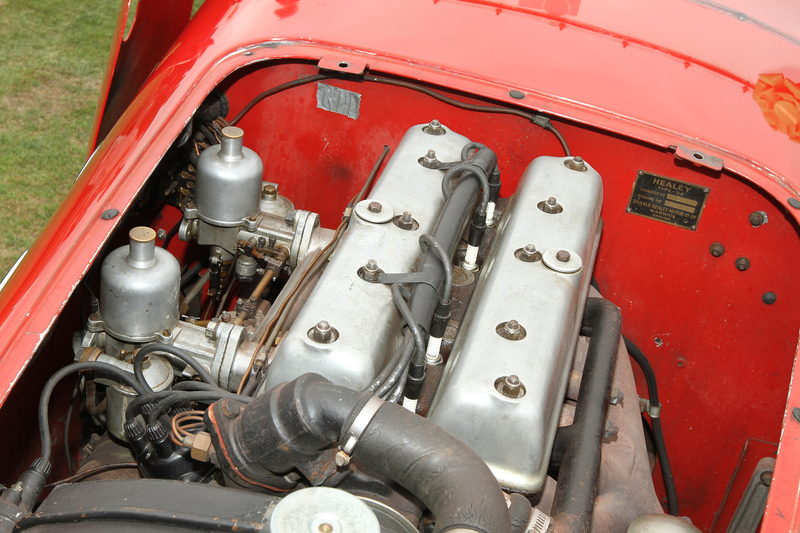 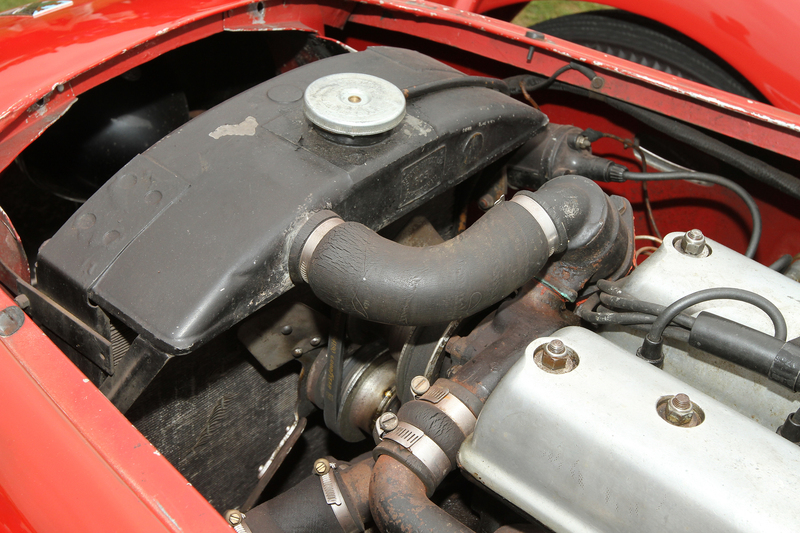 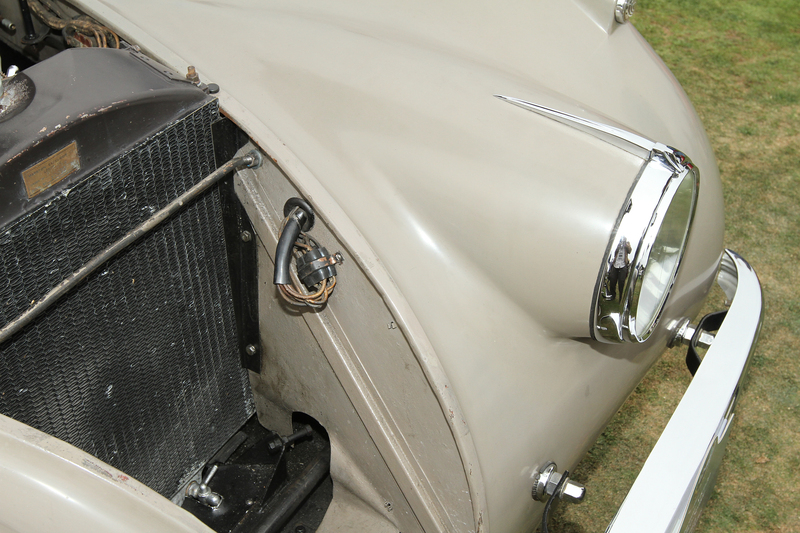 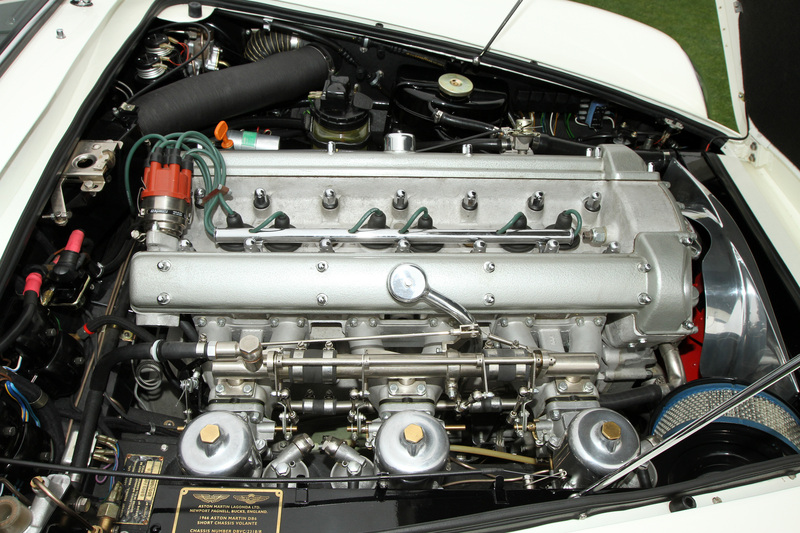 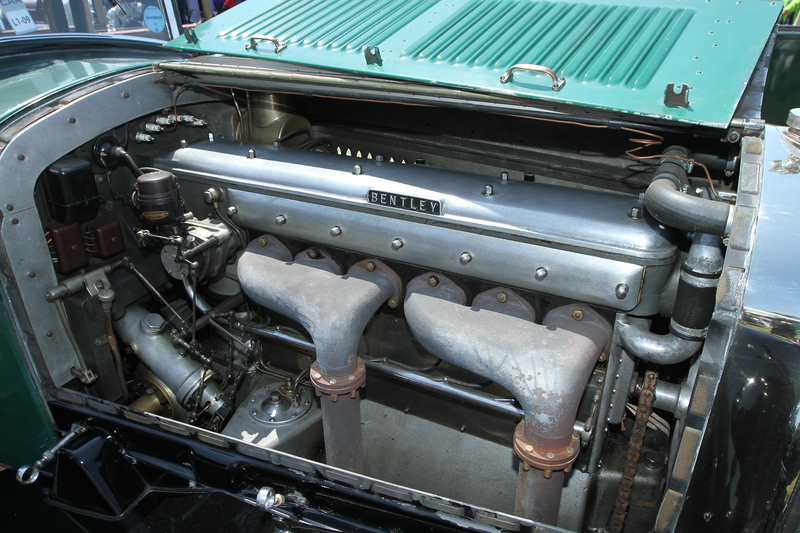 Richie Ginther tuned the XK engine and increased its capacity to 3.8 liters. 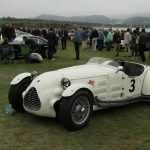 Parkinson raced his Special at Pebble Beach and elsewhere in 1951 and 1952 with excellent results, and it was also raced here by Chuck Daigh in 1954 and 1955.
a successful powerboat racer, she was also involved in helping Sir Malcolm Campbell and John Cobb establish world land speed records. 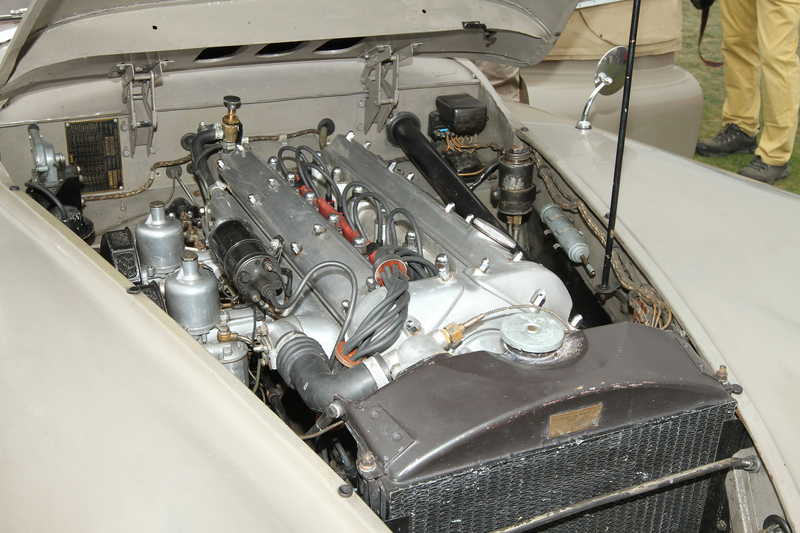 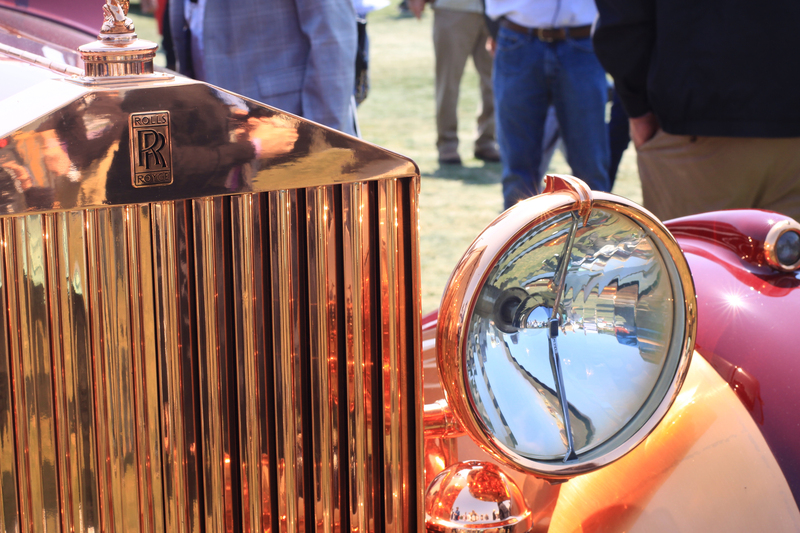 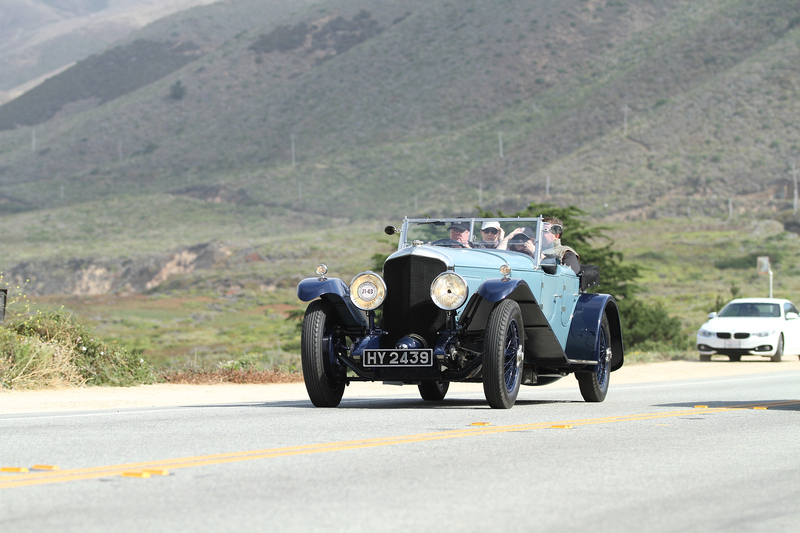 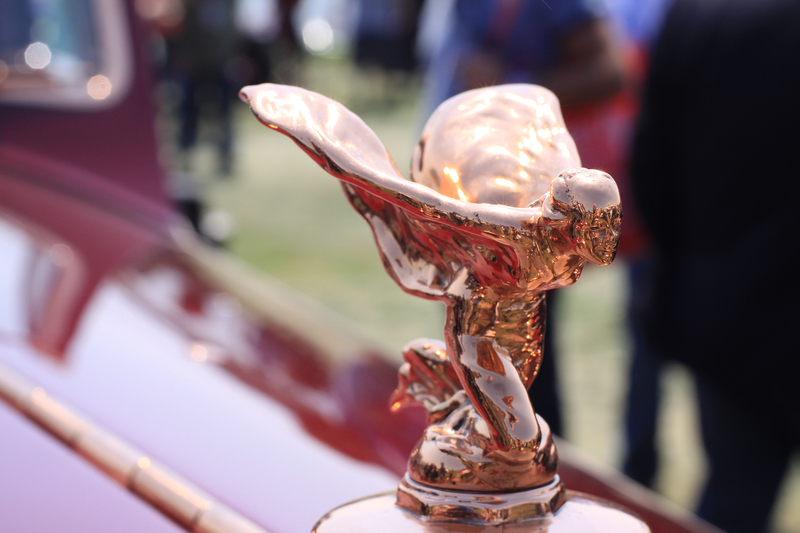 This rare Rolls-Royce was later owned by another record holder and collector, Briggs Cunningham. 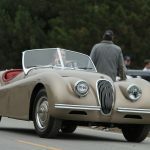 This Jaguar XK120 was imported by Max Hoffman at the beginning of 1954 and was sold to Bernard Yurt, a U.S. Air Force sergeant from Boston who later founded the New England XK Association. 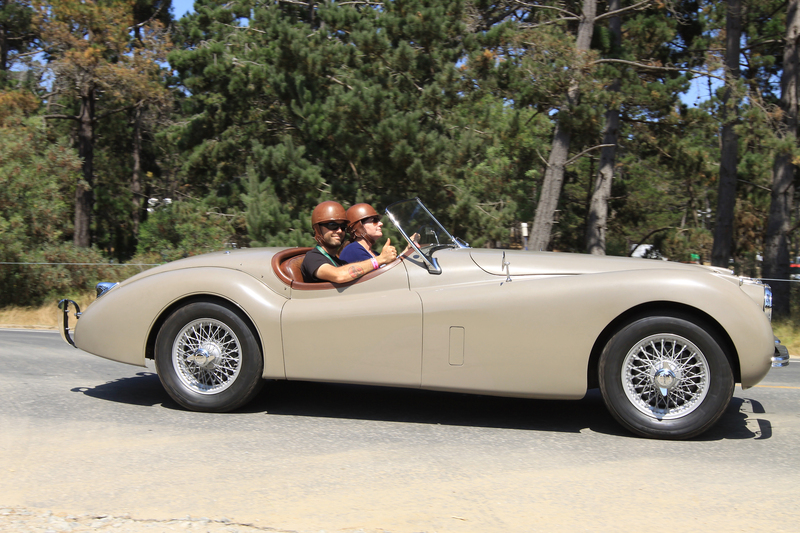 Yurt took fastidious care of his XK120, driving it only on special occasions and displaying it occasionally at regional car shows. 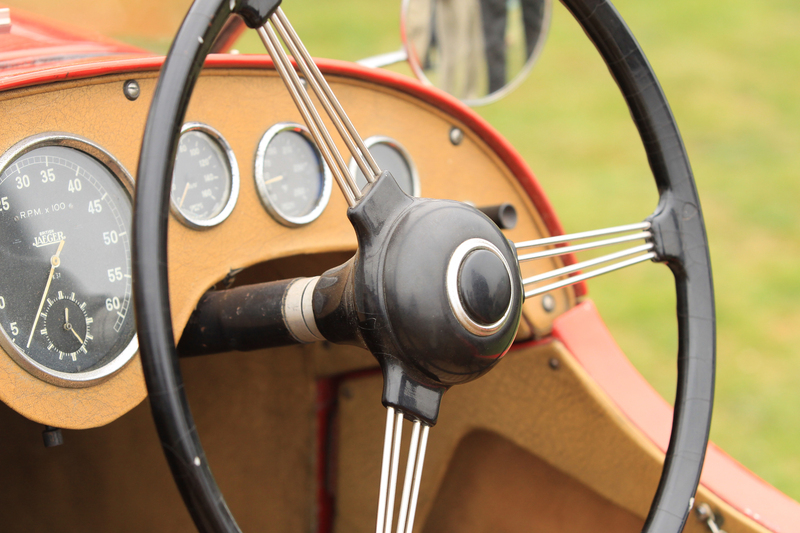 When the current owner bought the car from Mr. Yurt’s family in 2014, it had just 54,000 miles on the odometer. 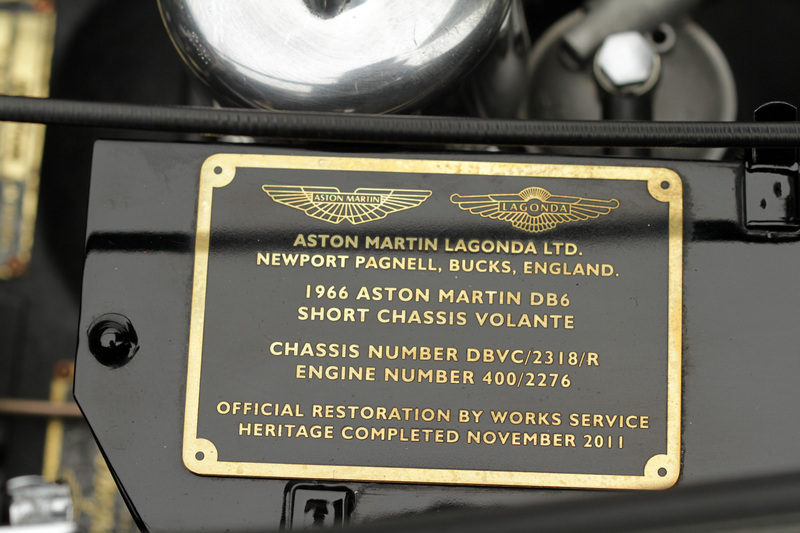 It has never been damaged, modified, painted or restored. 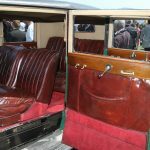 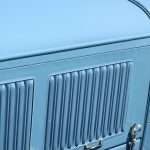 This chassis was first ordered on March 19th, 1937 by George Heath, LTD who commissioned W.C. Atcherly of Birmingham, England to construct the original Limousine body. 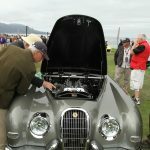 The car was then sold to a J.M. 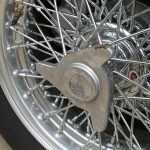 Nicholson of Birmingham, England. 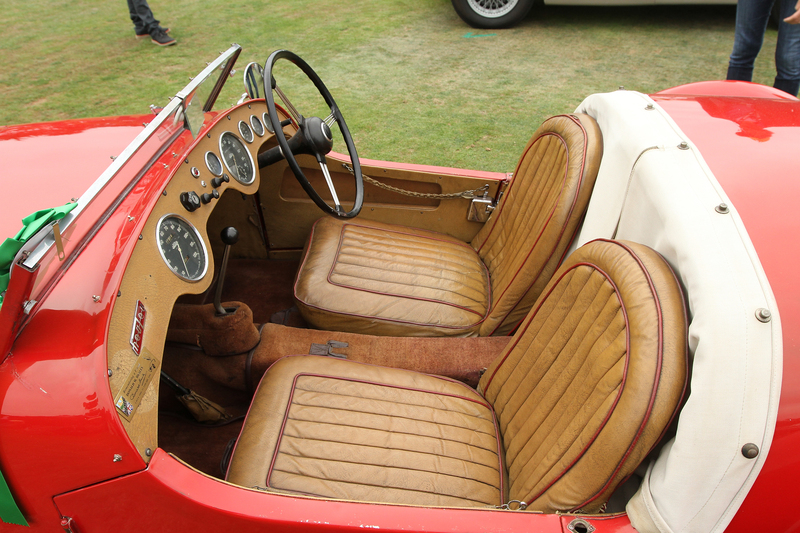 Like many other cars in the U.K., it was laid up during the war, but in 1945 the car was resurrected to have a second life. 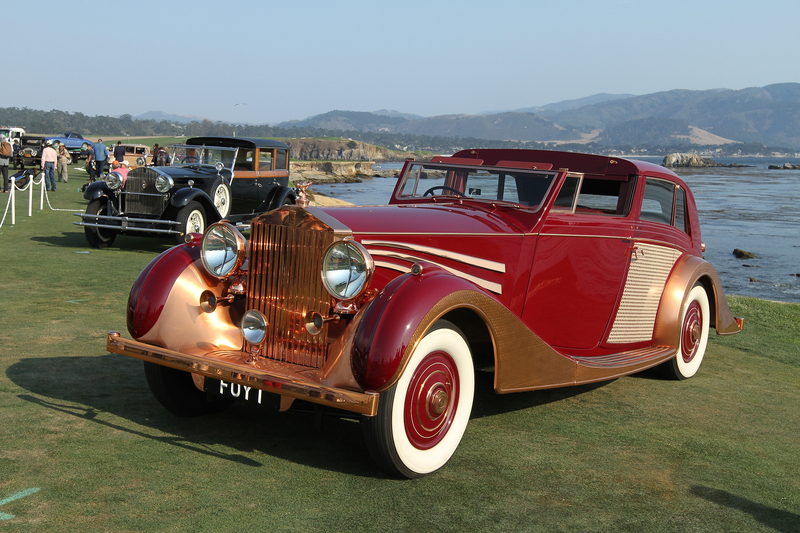 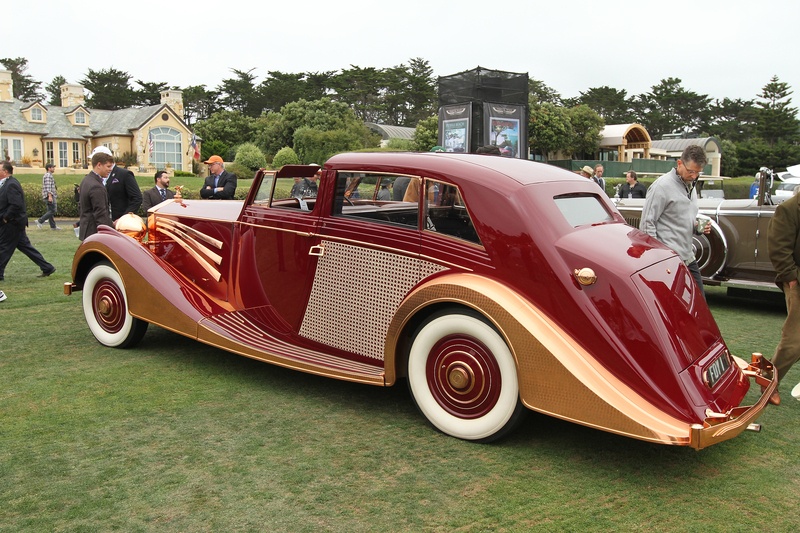 New owner John Gaul had a penchant for spectacular cars, several of which were bodied by Saoutchik. 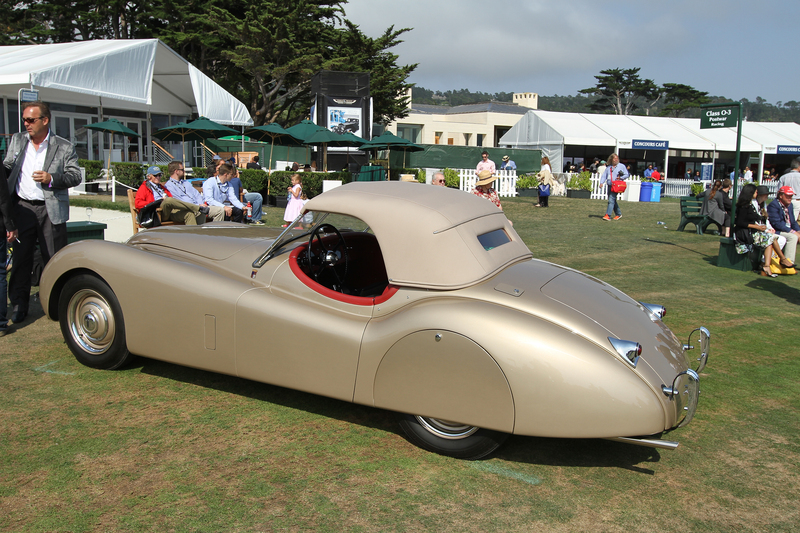 In early 1946 he commissioned Freestone & Webb to build him a body for this chassis. 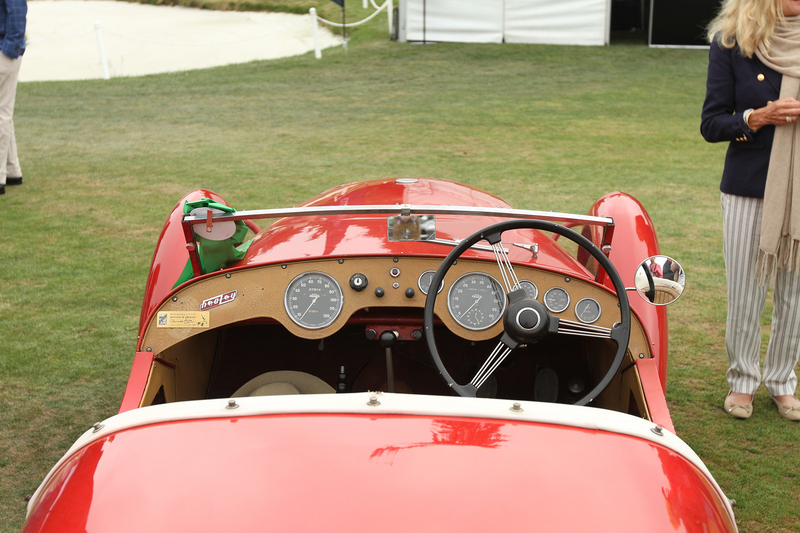 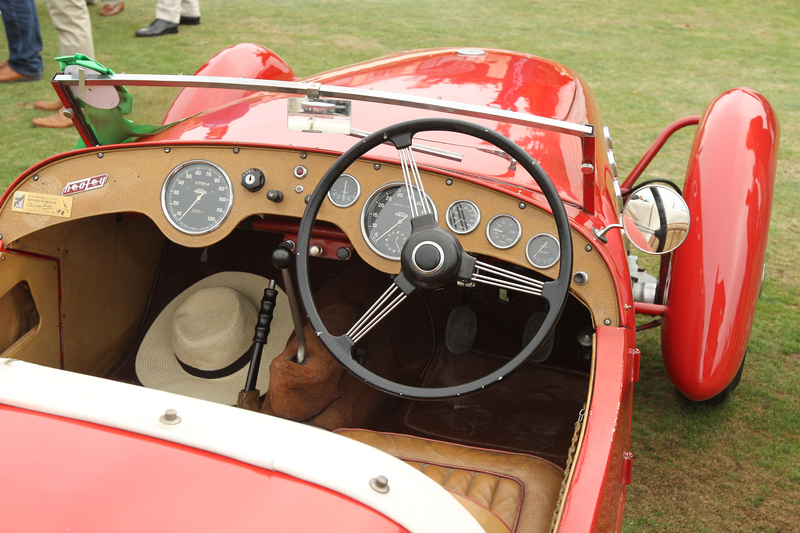 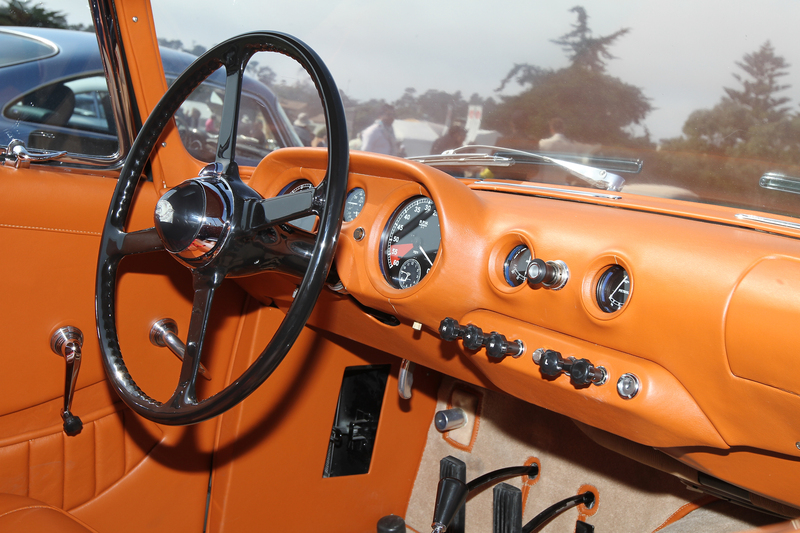 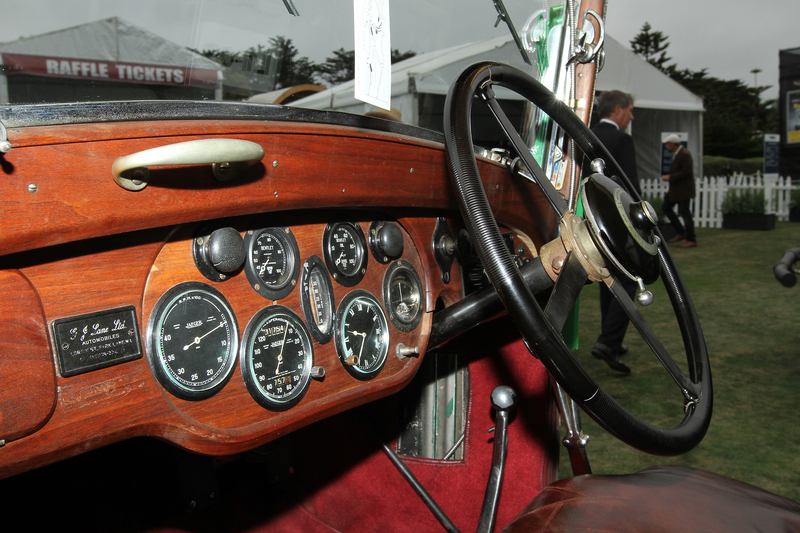 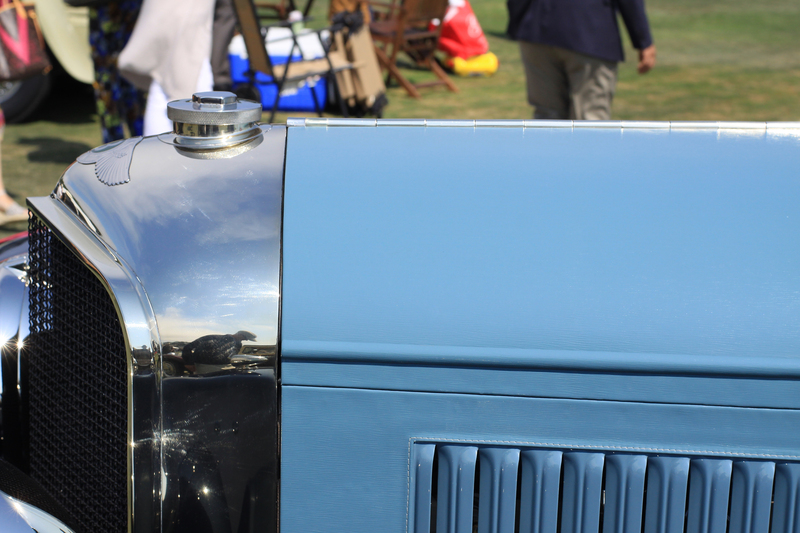 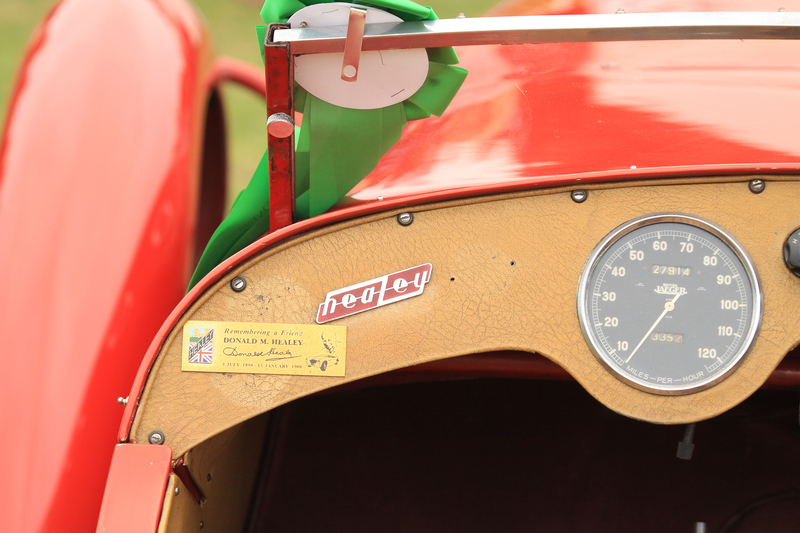 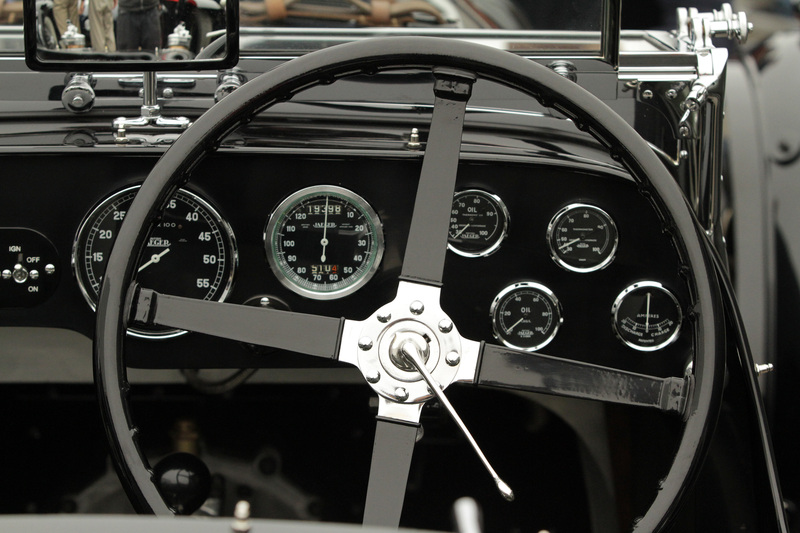 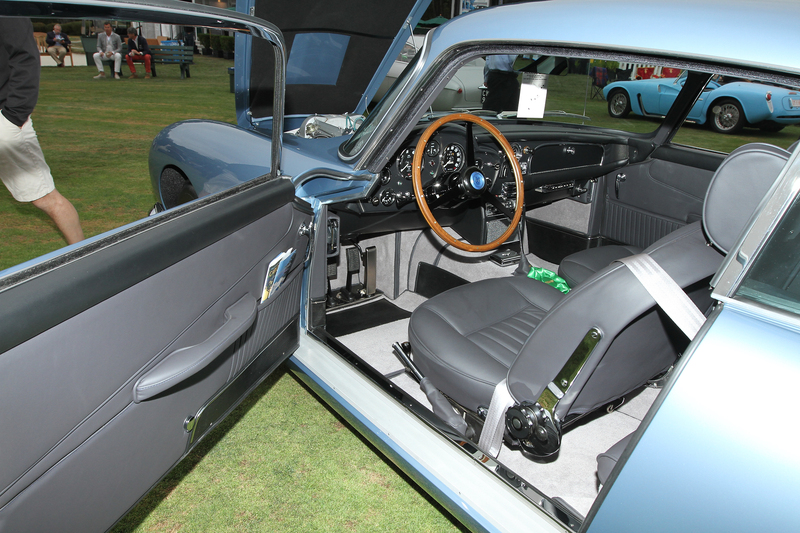 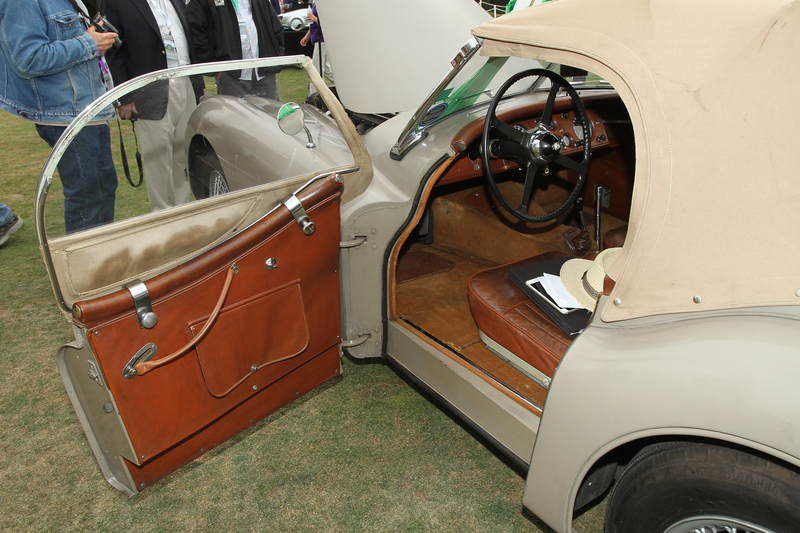 He instructed Freestone & Webb to build him a car that would win at any Concours d?Elegance. 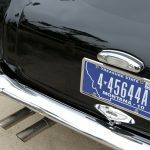 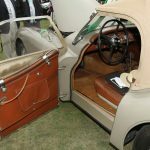 The car was delivered to Mr. & Mrs. Gaul in August of 1946 which was the very first Freestone & Webb car delivered after the war. 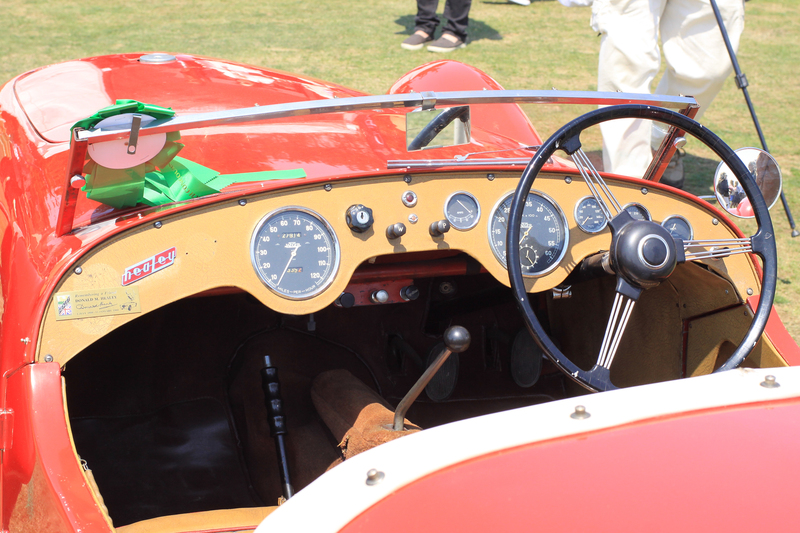 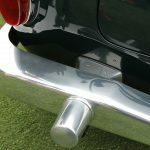 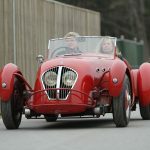 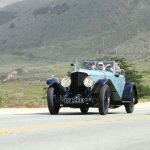 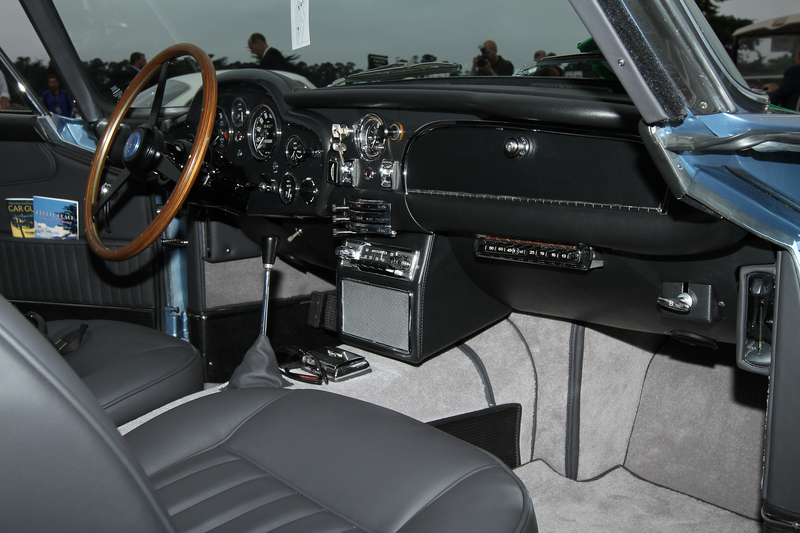 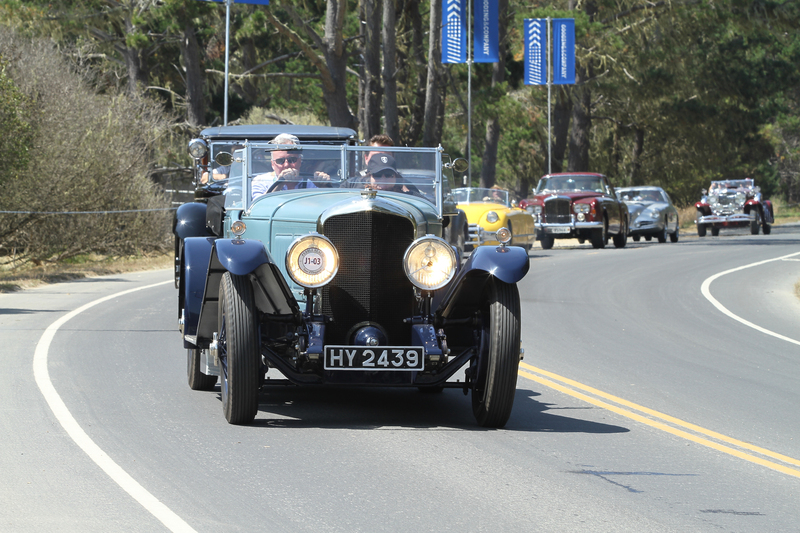 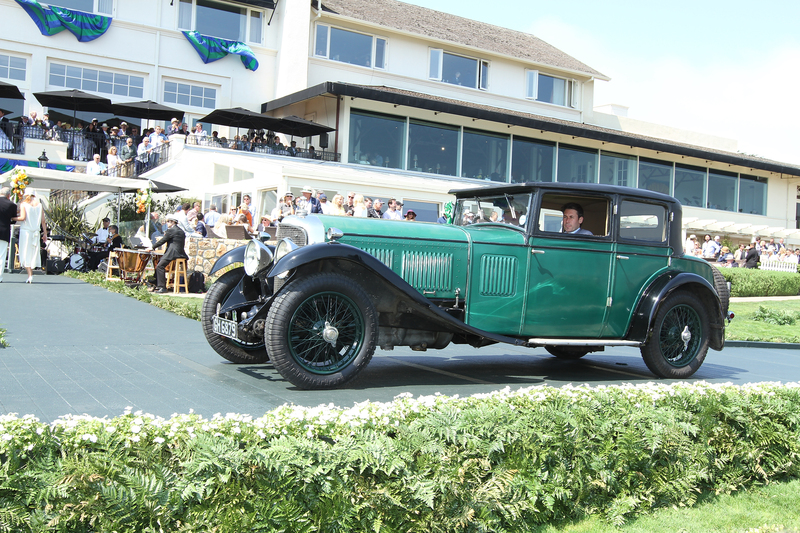 It was used extensively for Concours d?Elegance in Deauville, Monte Carlo and Cannes which the car won the Grand Prix. 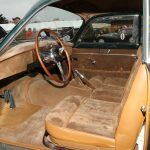 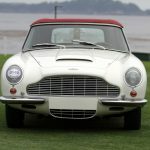 The car was sold in 1954 to a Mr. L. Zimbler of the U.K. and factory records show that the car was owned in South Africa in 1957, then the Netherlands in 1957, then back to the U.K. in 1964. 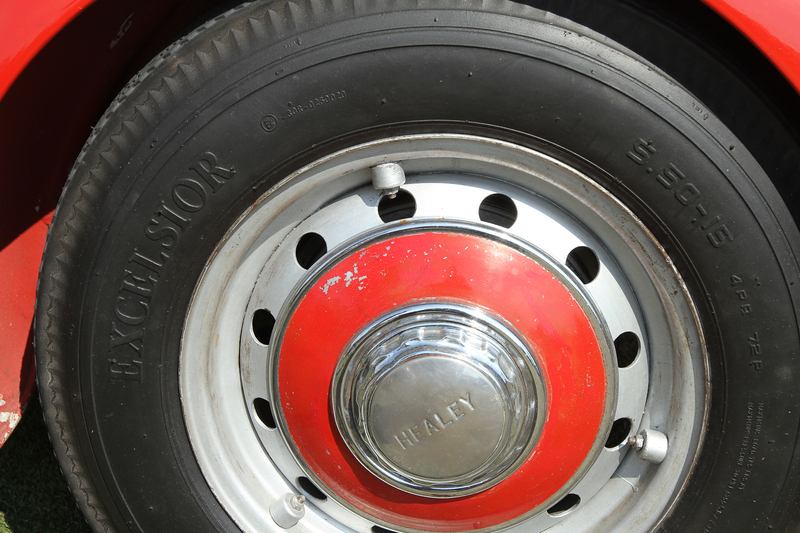 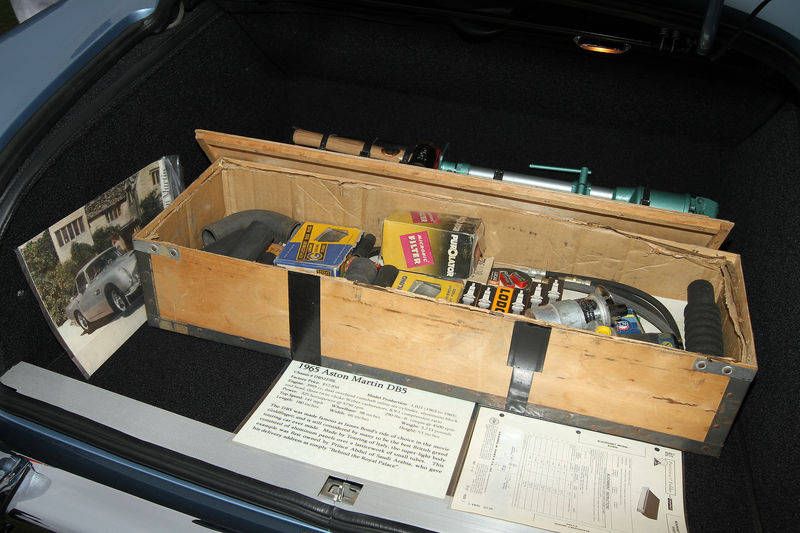 In 1966, the car was shipped to the United States. 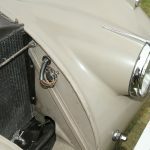 The car was then owned by a Richard Sinicki of Pittsburg, Pennsylvania where the car remained unseen for many years. 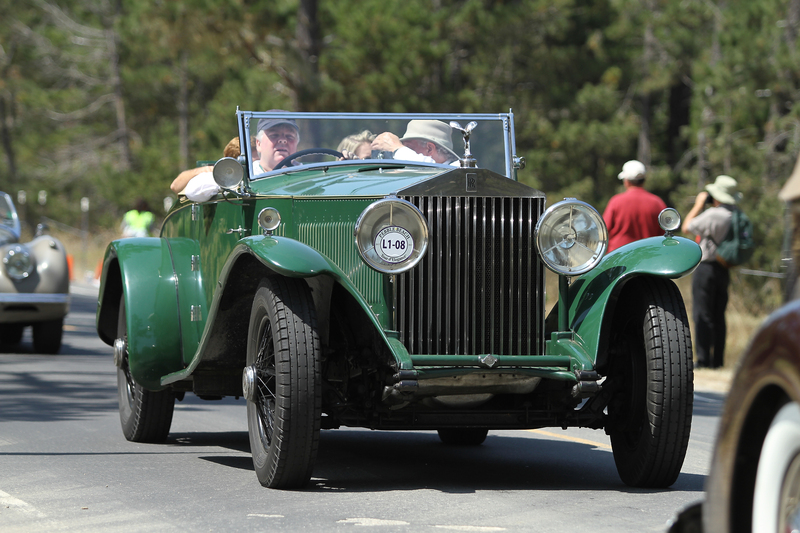 Its current owner, Don Williams purchased the car in 2000. 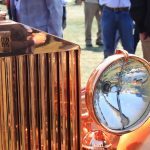 The car known as the ?Copper Kettle? 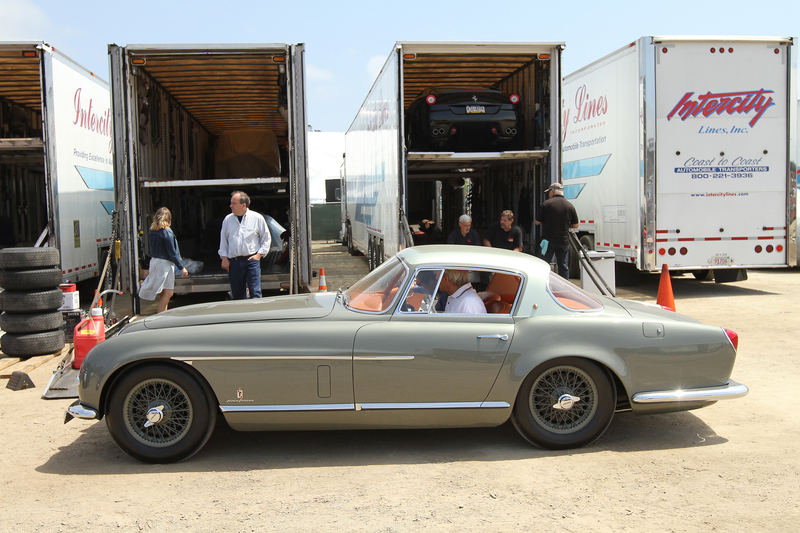 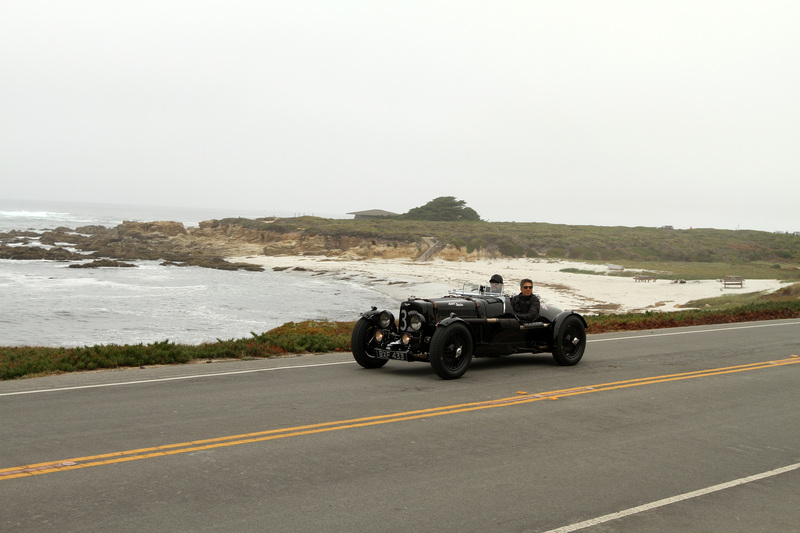 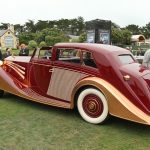 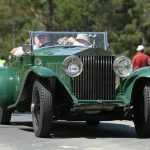 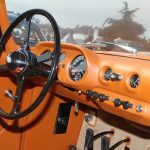 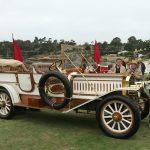 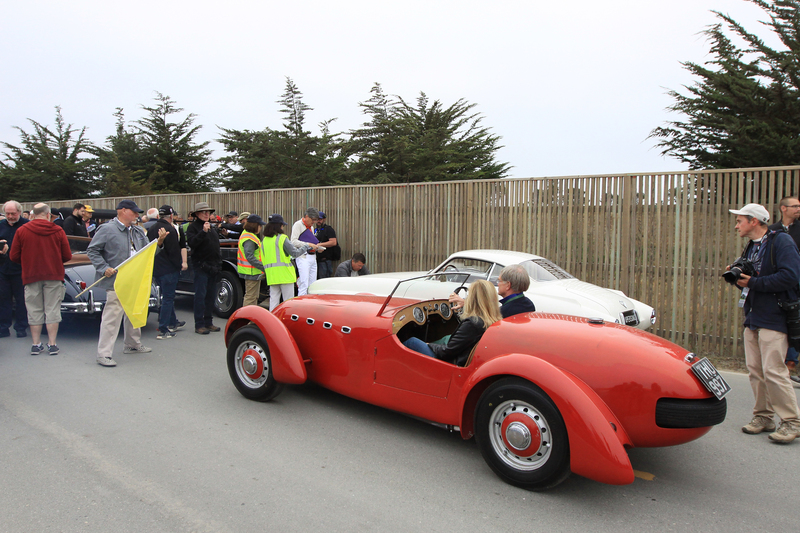 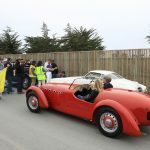 has gone through an extensive 6 year restoration by Mike Fennel Restorations and was finished in August of 2008 which resulted in a 1st in Class and Lucius Beebe Trophy at the 2008 Pebble Beach Concours d?Elegance. 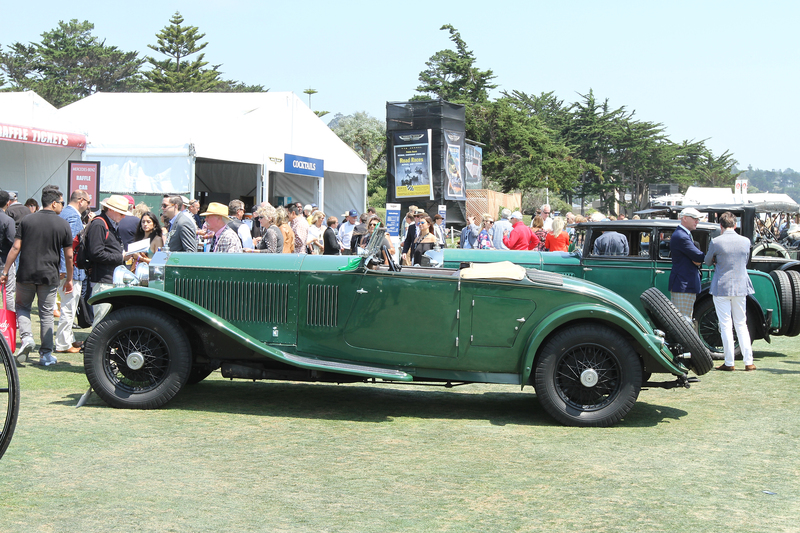 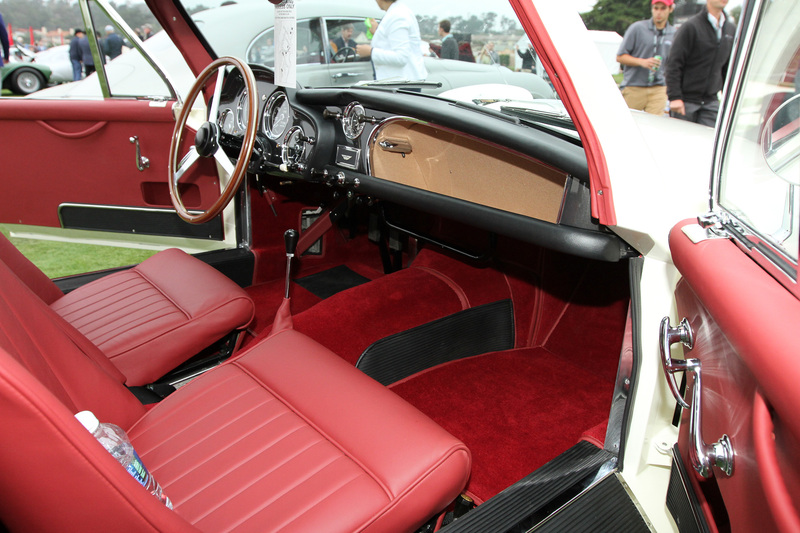 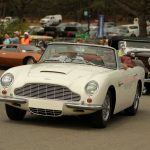 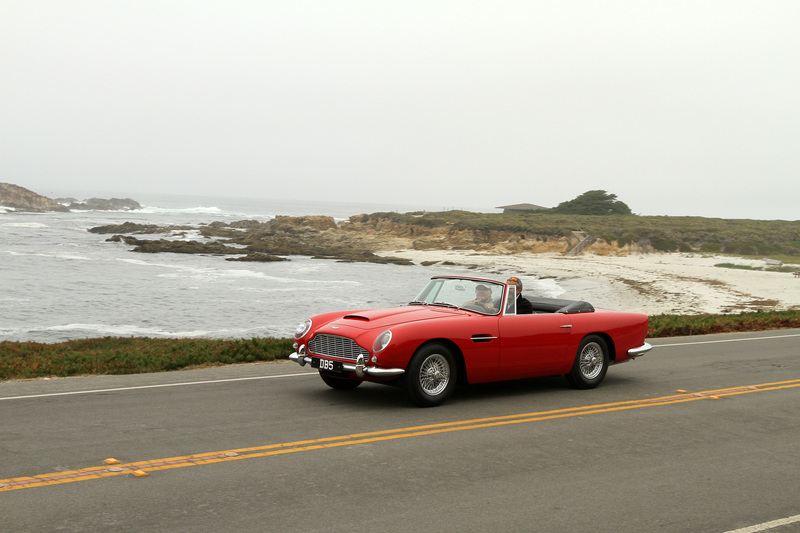 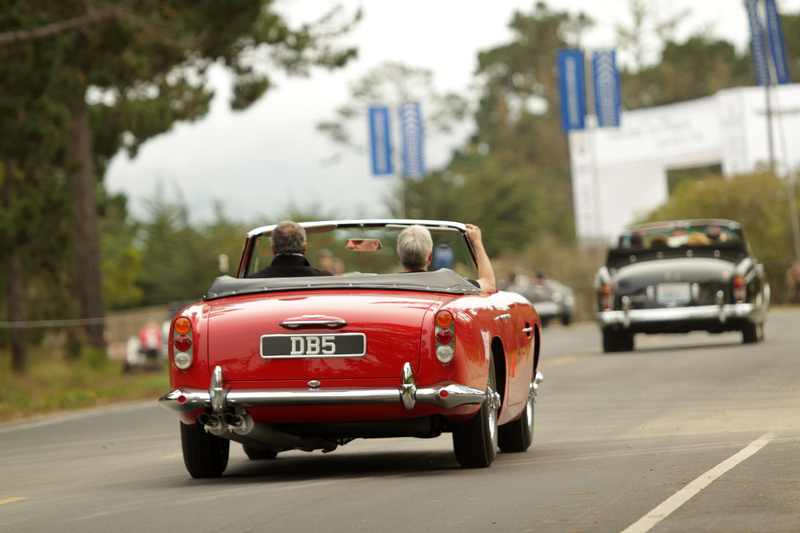 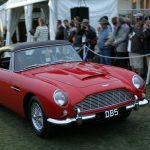 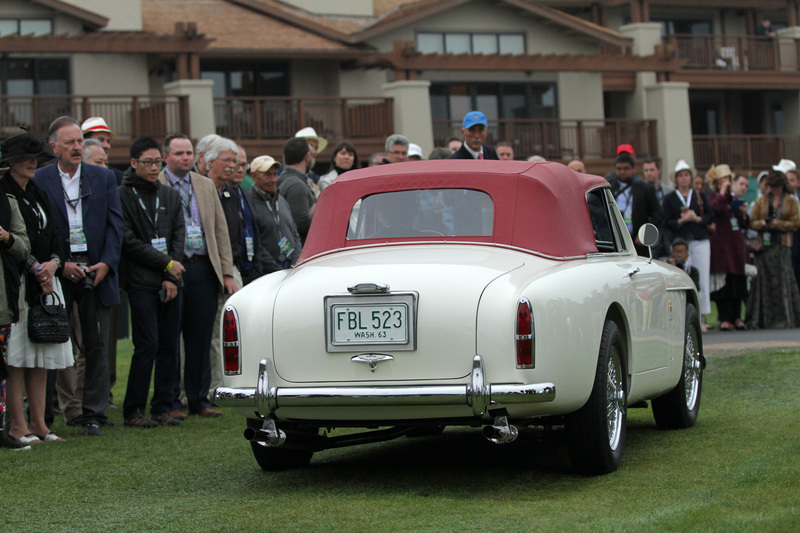 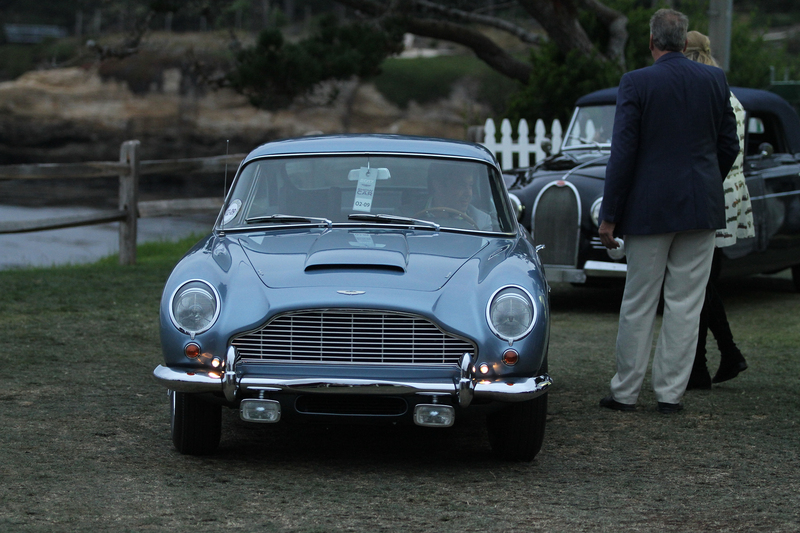 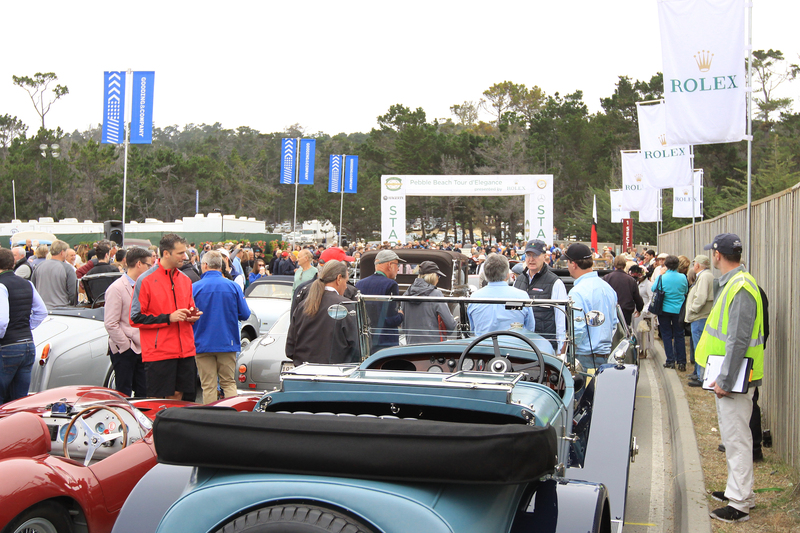 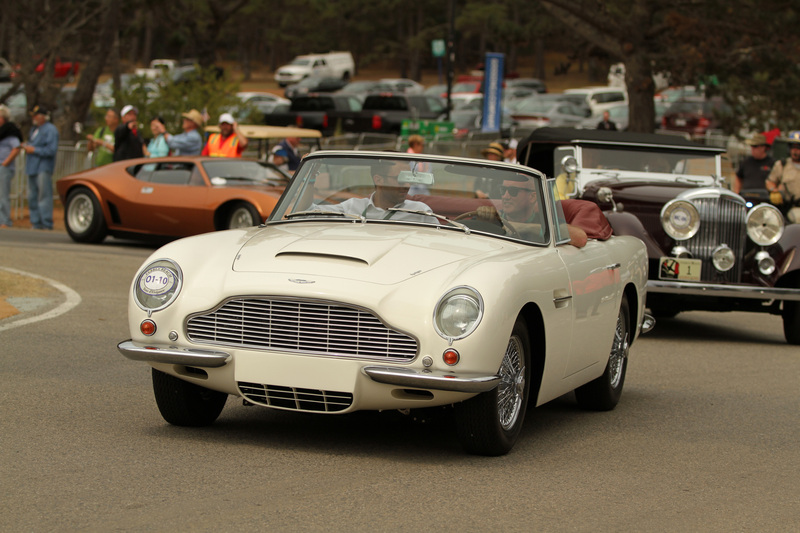 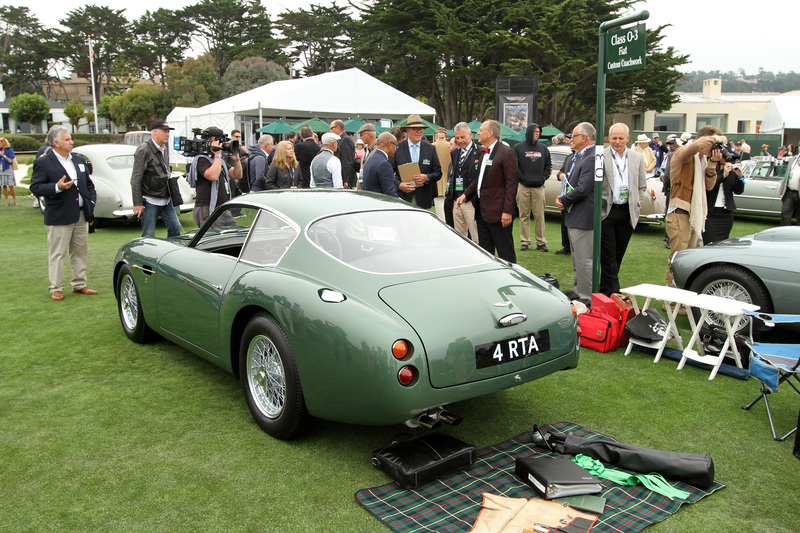 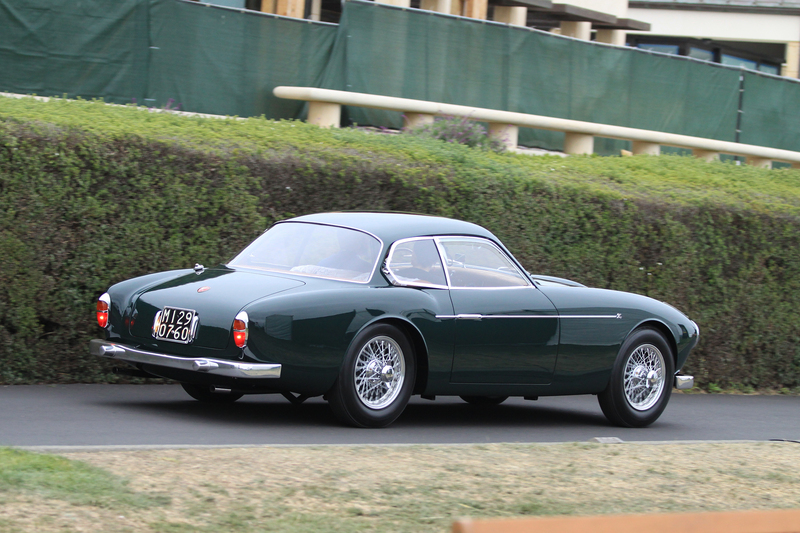 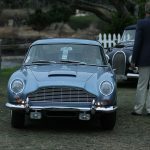 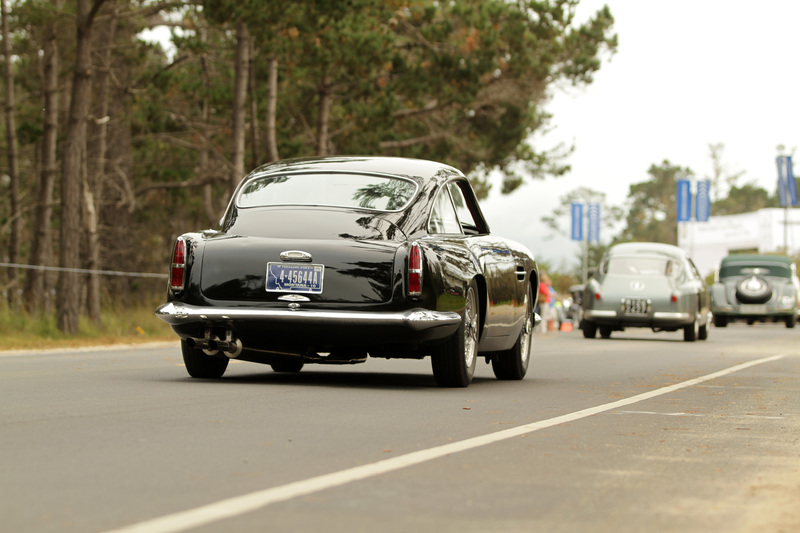 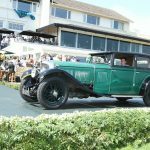 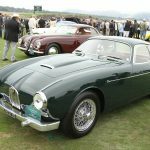 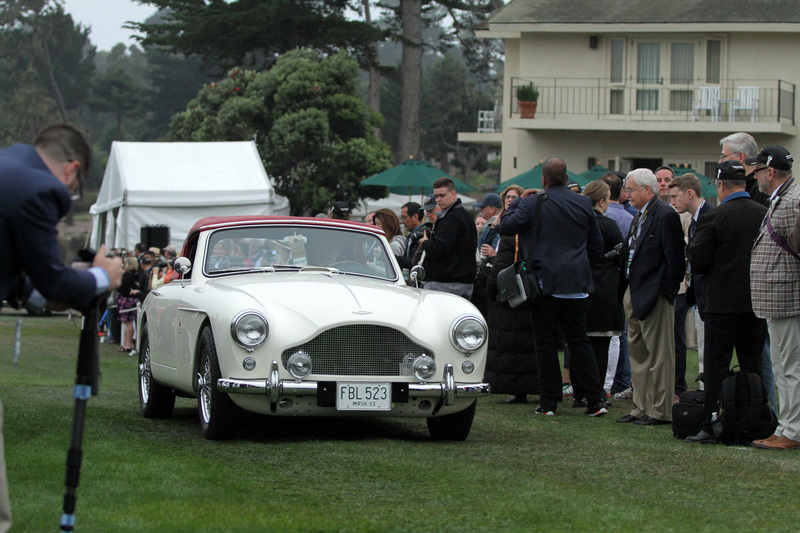 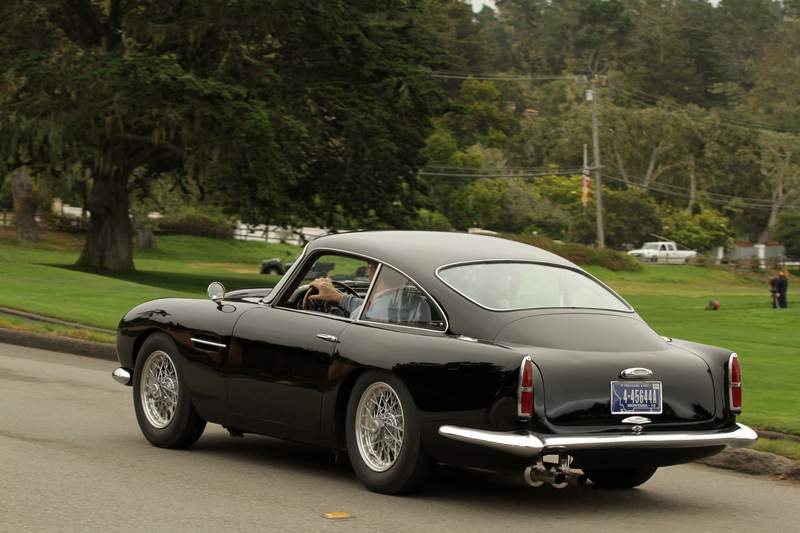 This year some of the world’s best Aston Martins were on display at the 2016 Pebble Beach Concours d’Elegance. 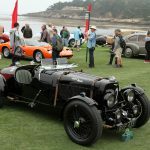 But these were scattered around in the various classes, as Pebble’s focus for 2016 was racing GT40s, Delahayes, early indy cars and Chapron Coachwork. 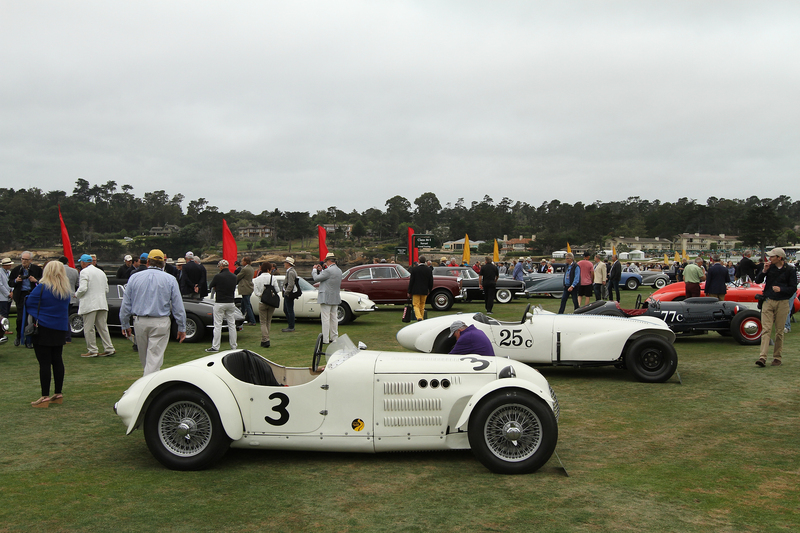 All images by Richard Michael Owen with car descriptions by Pebble Beach Company. 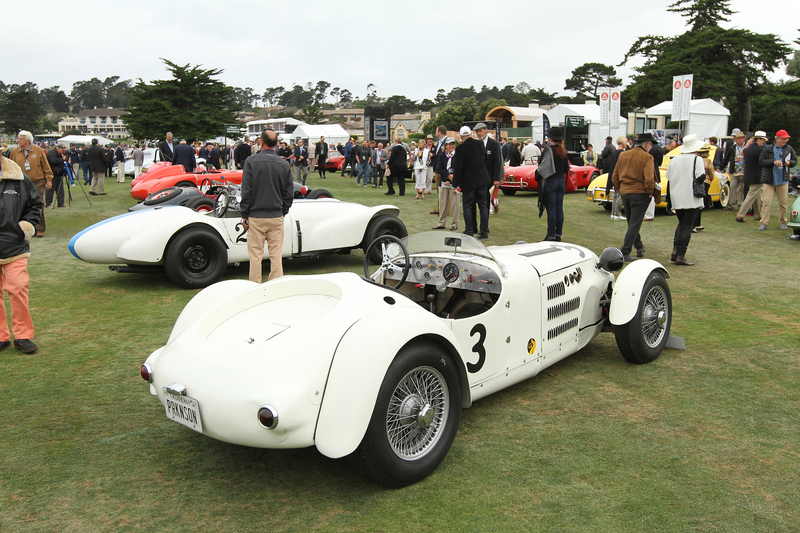 The Aston Martin Ulster, one of the most successful British-built prewar race cars, was based on the 1500 cc–engined Aston Martin Mark II. 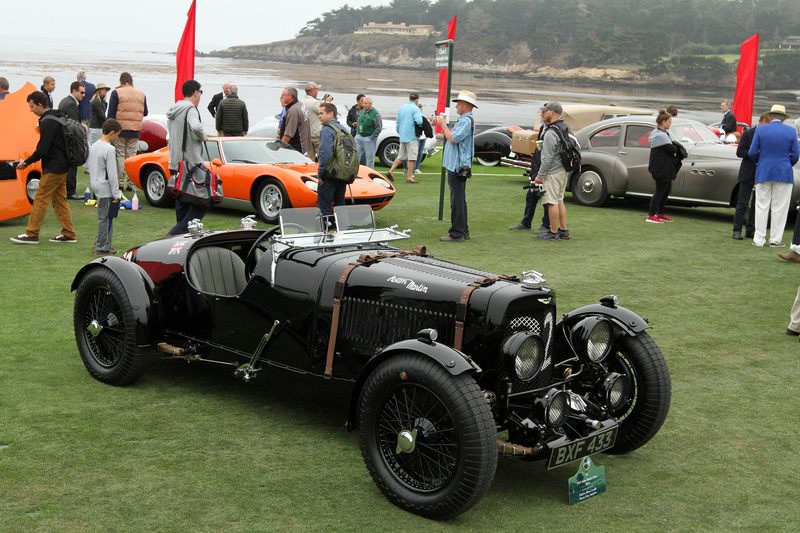 After Aston’s success at the 1934 Tourist Trophy, 21 Aston Martin Ulsters were built for sale to privateers. 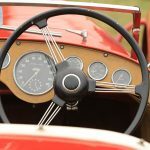 This particular Ulster (chassis K4 509 U) was built in 1934 for amateur driver Peter Donkin, who finished 11th overall in his first race at Le Mans with co-driver Lord Malcolm Douglas-Hamilton. 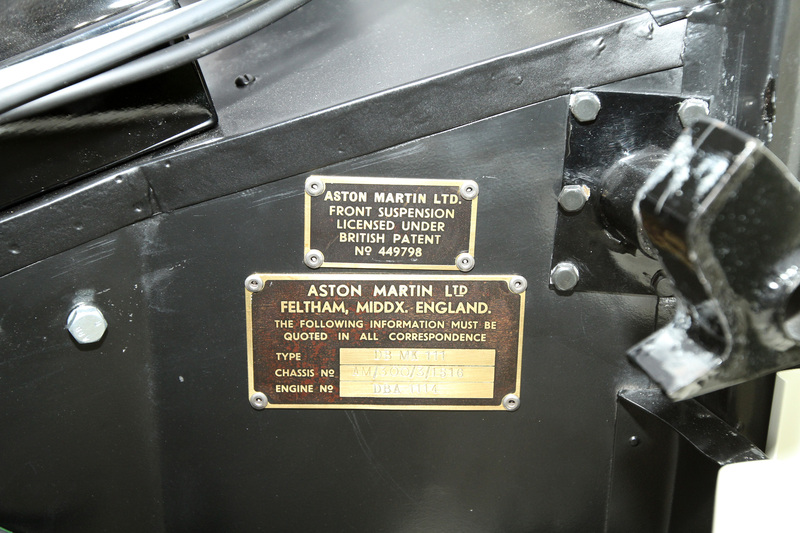 Seven Astons entered Le Mans that year, including three team cars and four privateers—and all but one finished. 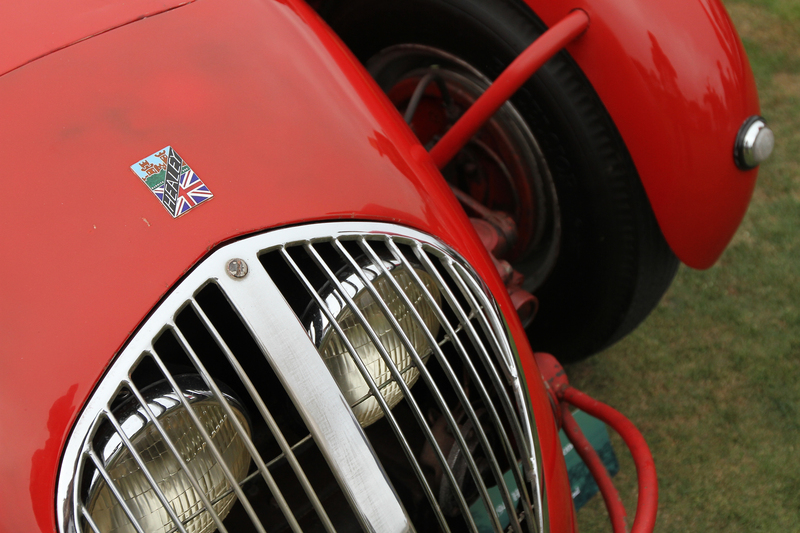 This Ulster went on to race successfully at the Donington 12 Hour race in 1937 and the nternational Ulster Tourist Trophy Race in 1946. 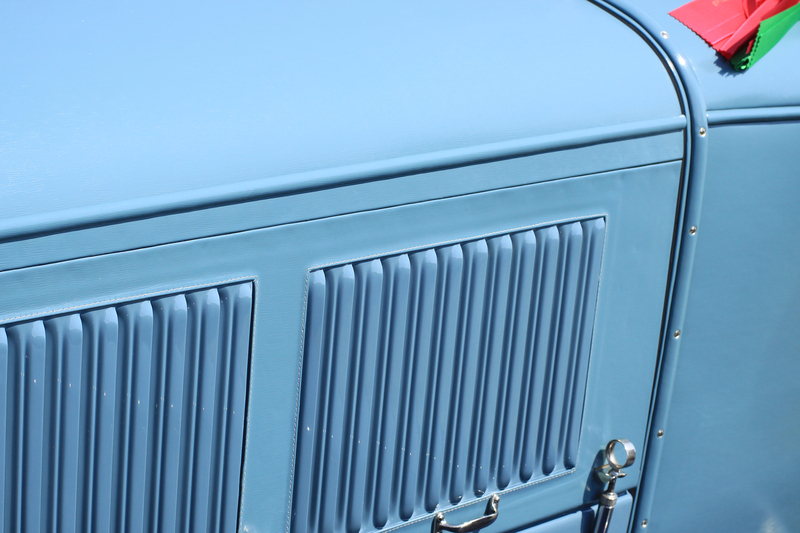 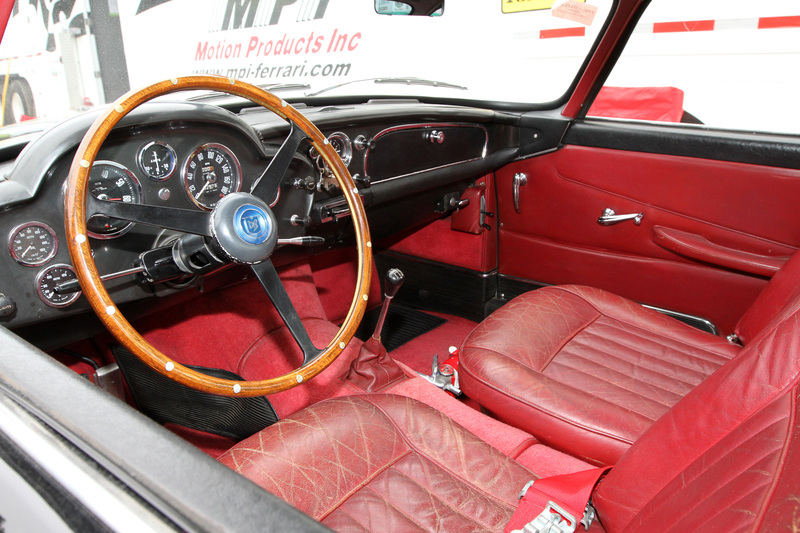 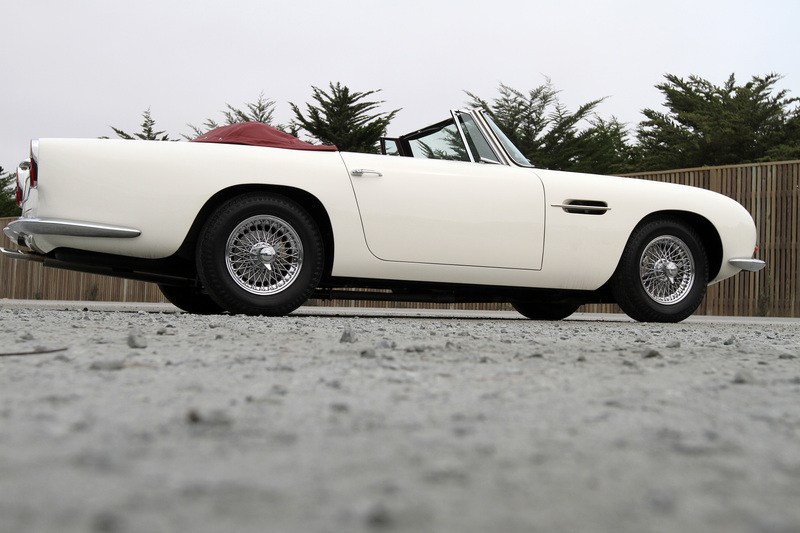 It has been raced virtually all of its life and has now been fully restored. 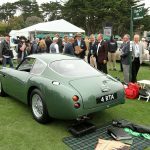 This is one of only 30 left-hand drive Touring-bodied DB4GTs from the total production run of 94 DB4GTs, including 19 built by Zagato. 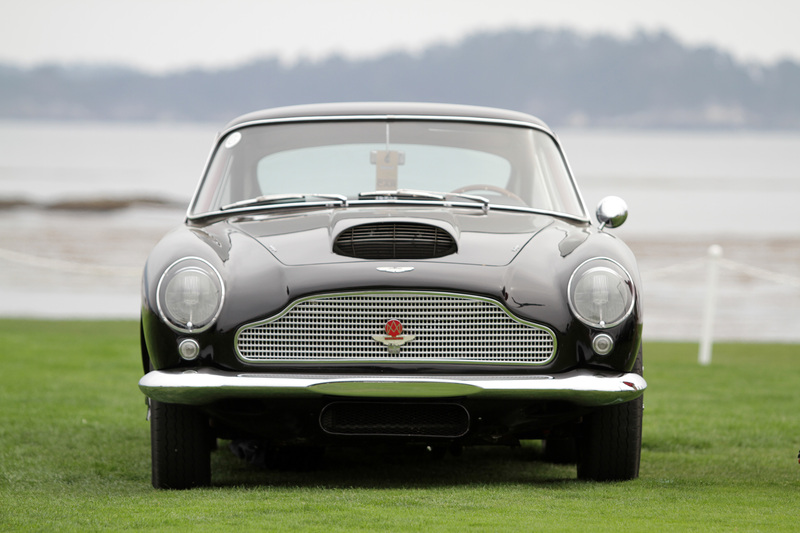 The DB4GT accelerated from 0 to 60 in 6.4 seconds, with a maximum speed of 152 mph, and it was the first sports car in the world to do zero to one hundred and back to zero in 20 seconds, thanks to its four-wheel Girling competition disc brakes. 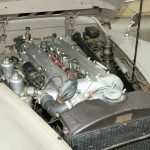 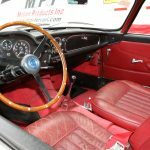 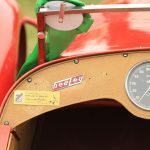 This car was raced in period at the 12 Hours of Sebring in 1961, driven by Sherman Decker and Bob Bucher, and has been driven regularly on road and track by each of its four owners. 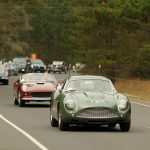 It raced competitively in the ’80s and ’90s at the Lime Rock Sprints and in 1989 at Laguna Seca when Aston Martin was the featured marque. 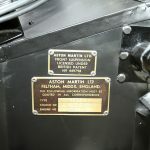 but it changed hands a few times over the years. 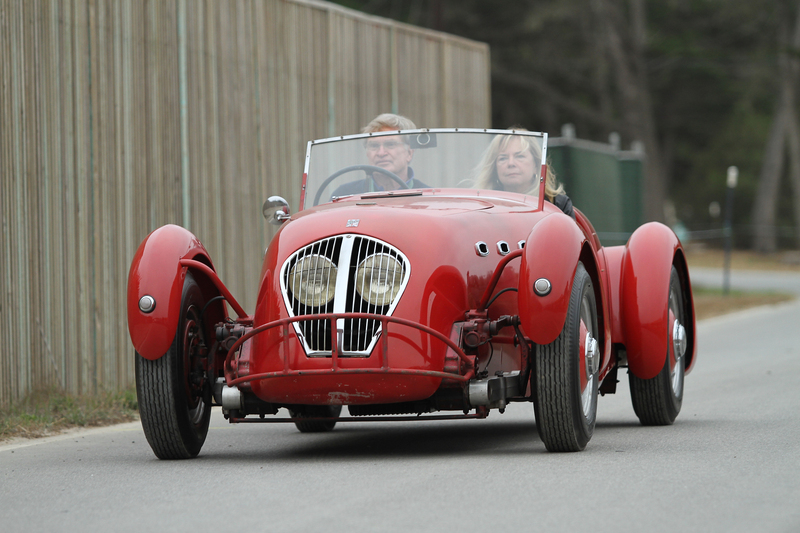 Joe Clark found the car again in 2012 and has overseen its complete restoration. 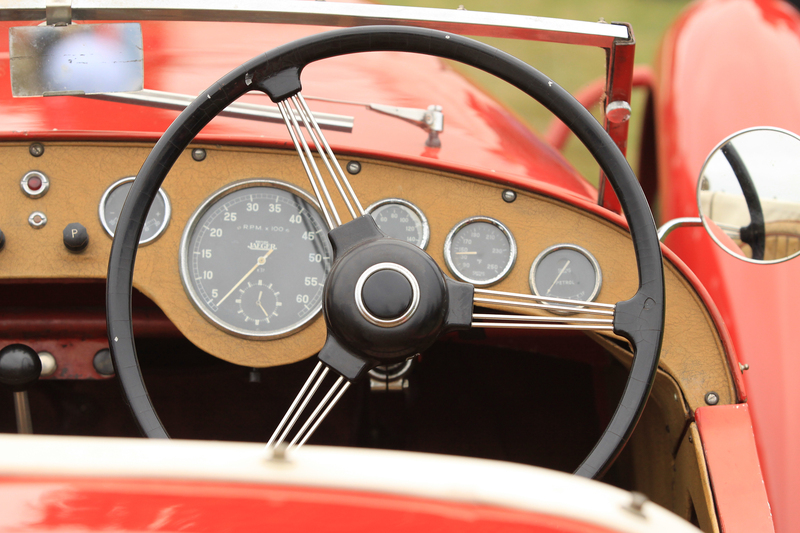 It is very close to his heart as he received his first speeding ticket in it at the age of 17! 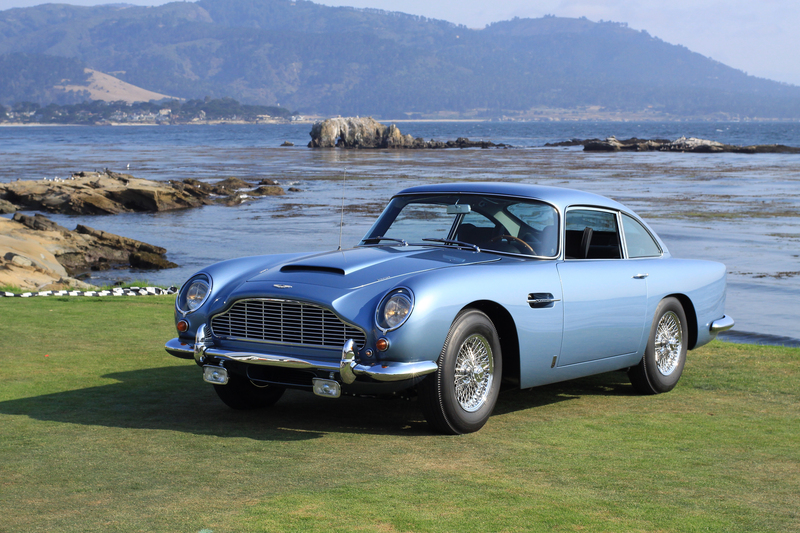 This Aston Martin DB5 is one of 19 left-hand drive examples built from a total of 123 convertibles. 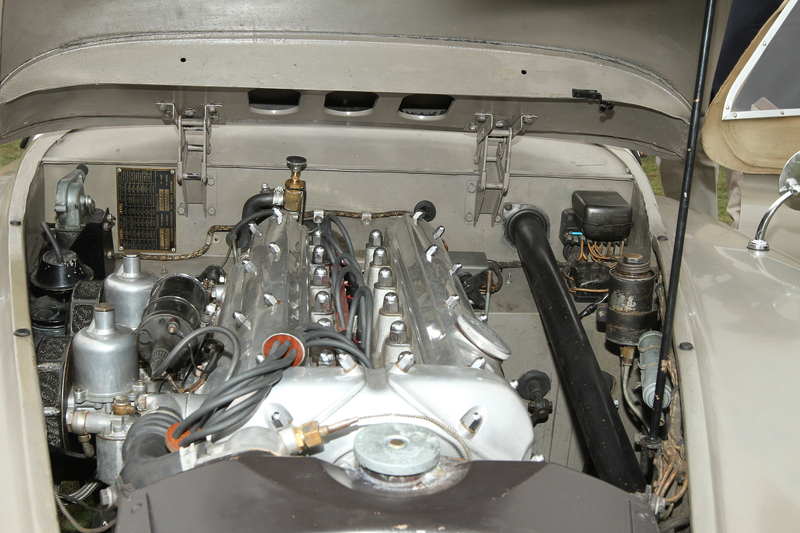 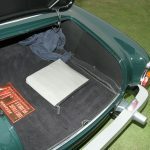 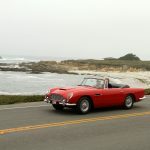 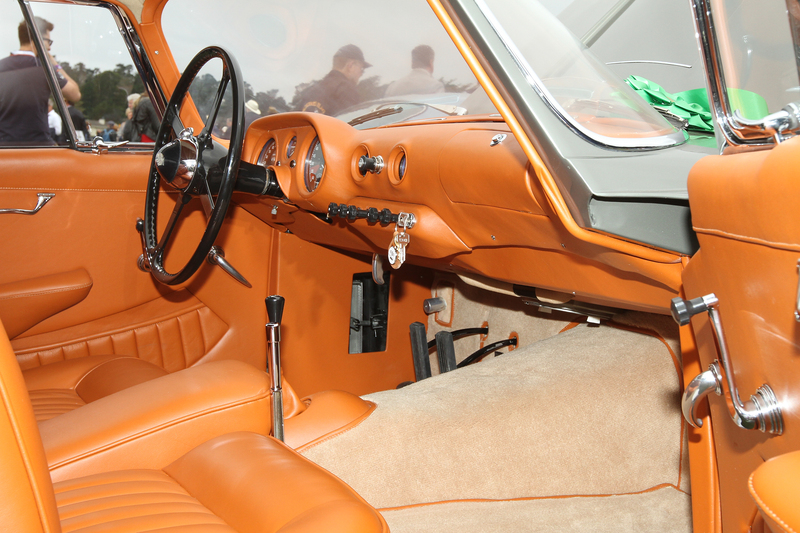 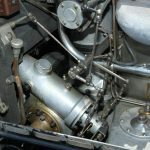 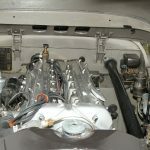 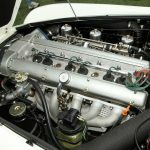 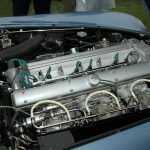 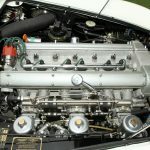 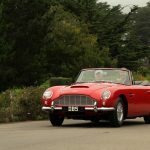 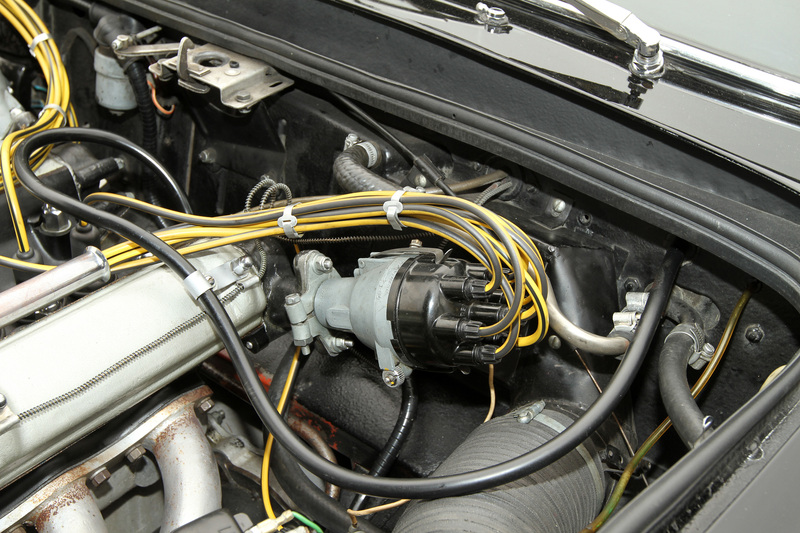 The convertible (chassis DB5C/1253/L) was shown at the New York and Los Angeles Auto Shows, and differs slightly from the production models: inside it has several fittings borrowed from its cousin, the Lagonda Rapide, and under the bonnet the aluminum cam covers are polished instead of painted and the carburetors, intake manifolds and various aluminum fittings are polished and chromed instead of nickel plated. 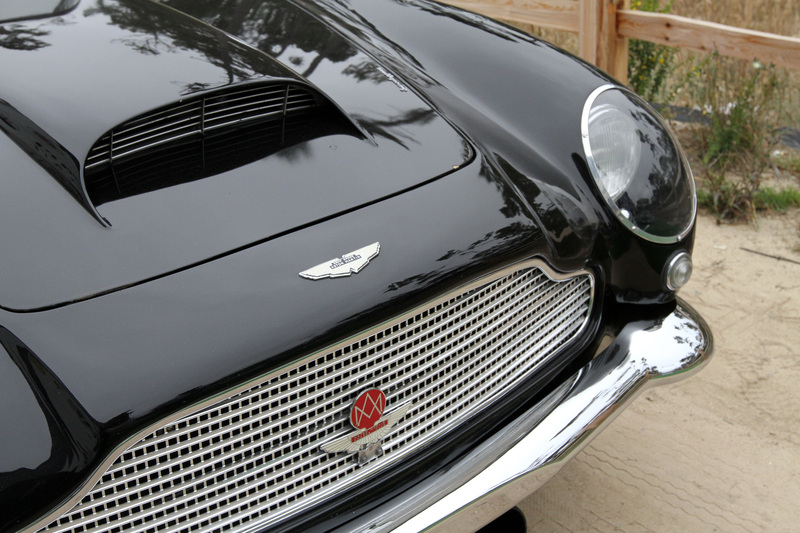 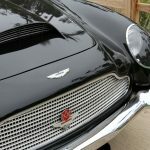 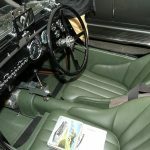 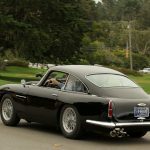 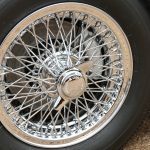 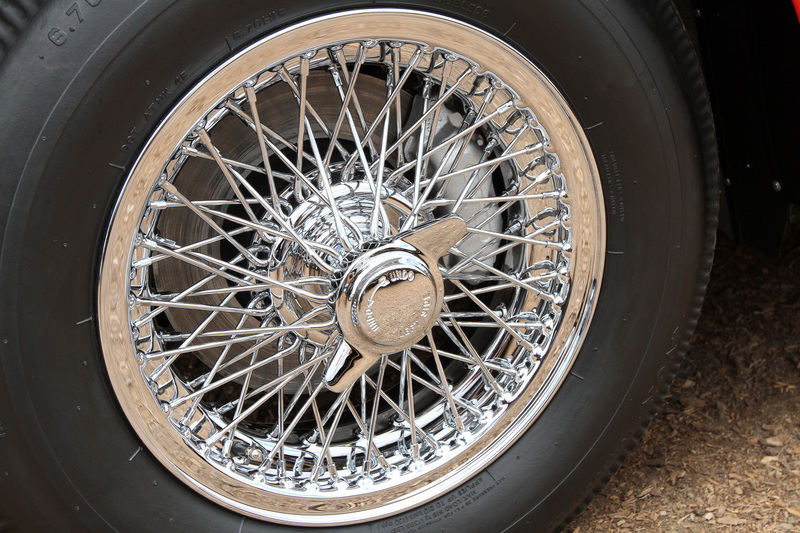 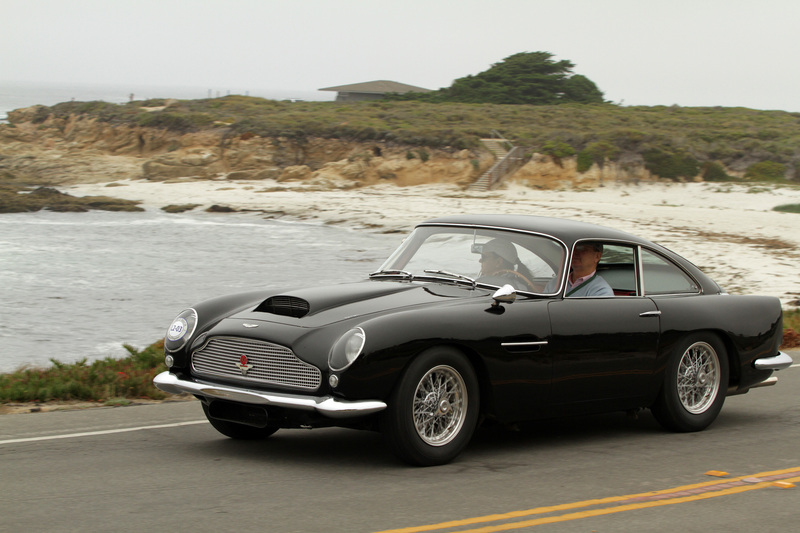 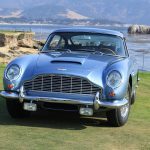 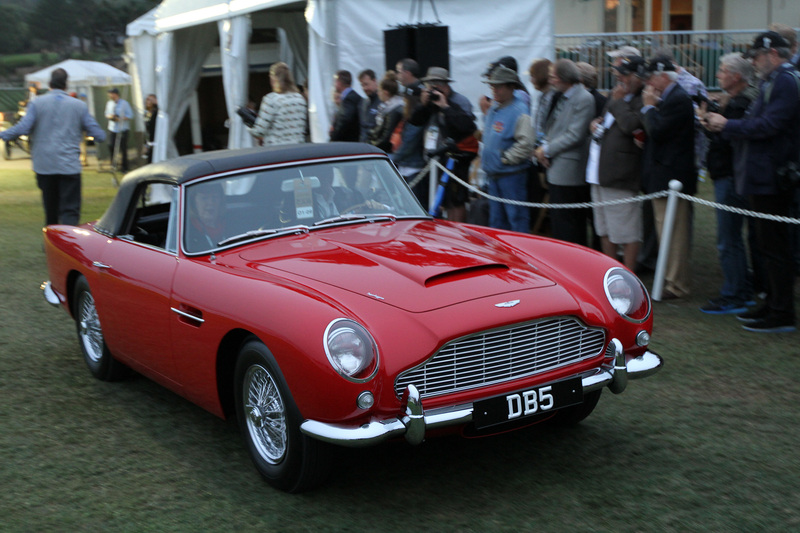 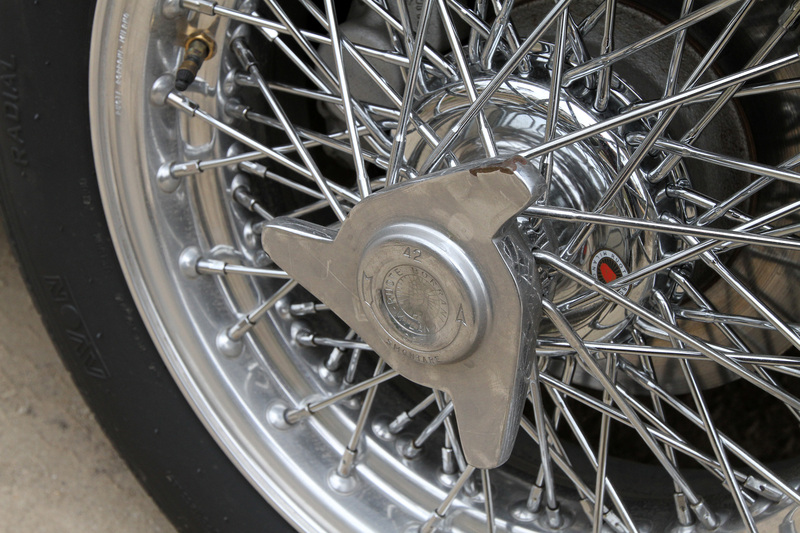 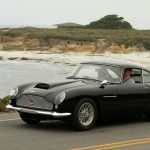 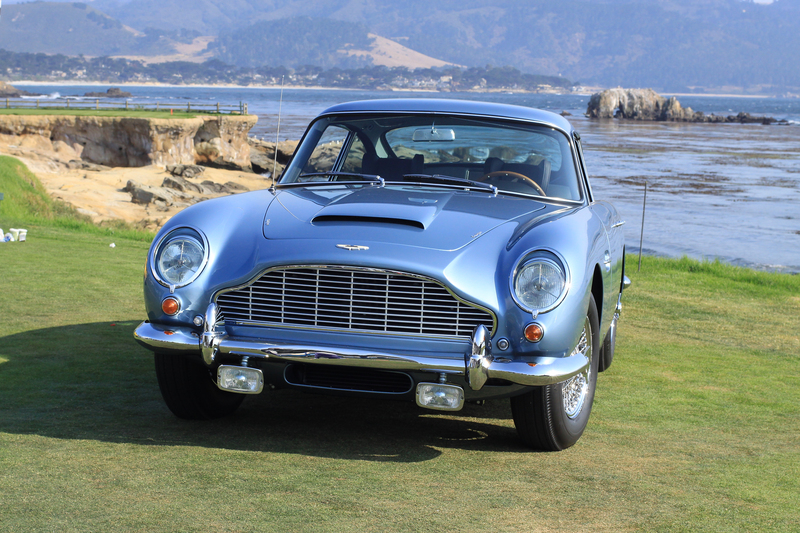 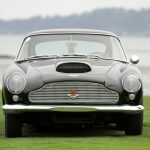 This DB5C show car, complete with chromed Borrani wire wheels, was purchased immediately after the Los Angeles Show by retired US Admiral Robert Miller, who kept the Aston Martin at his home in Santa Barbara, California, until he died in 1993. 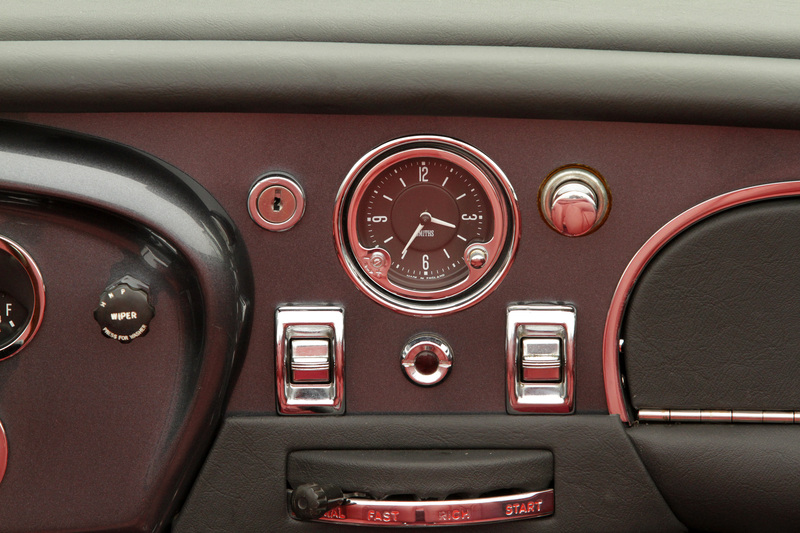 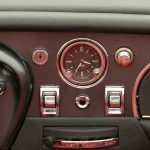 The car was bought by its current owner in 2013 with just 34,916 miles on the clock. 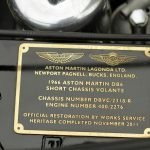 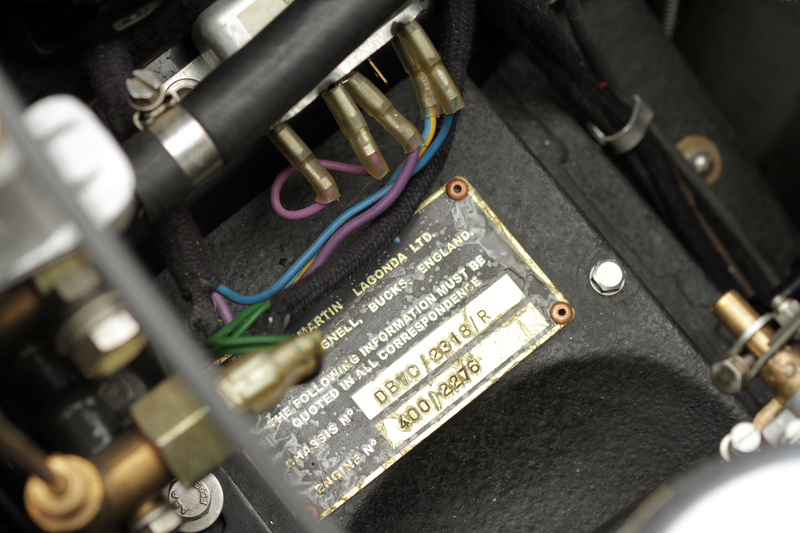 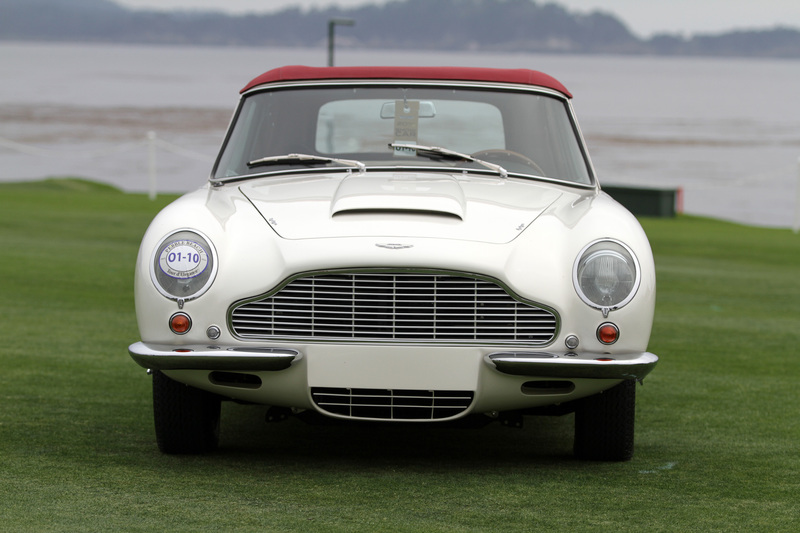 The Aston Martin Short Chassis Volante was an interim model between the DB5 and the DB6. 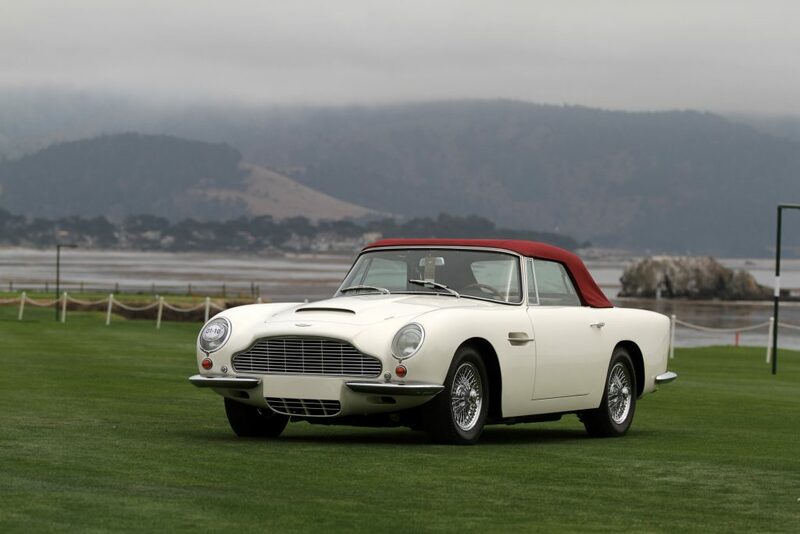 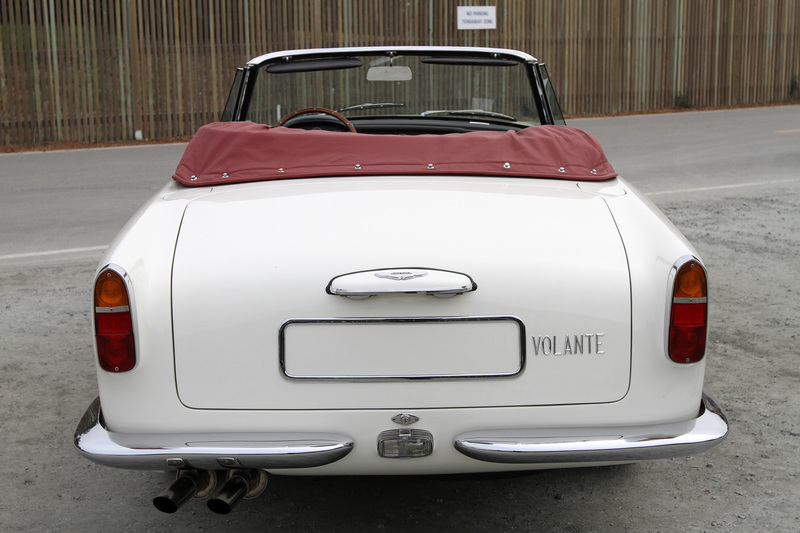 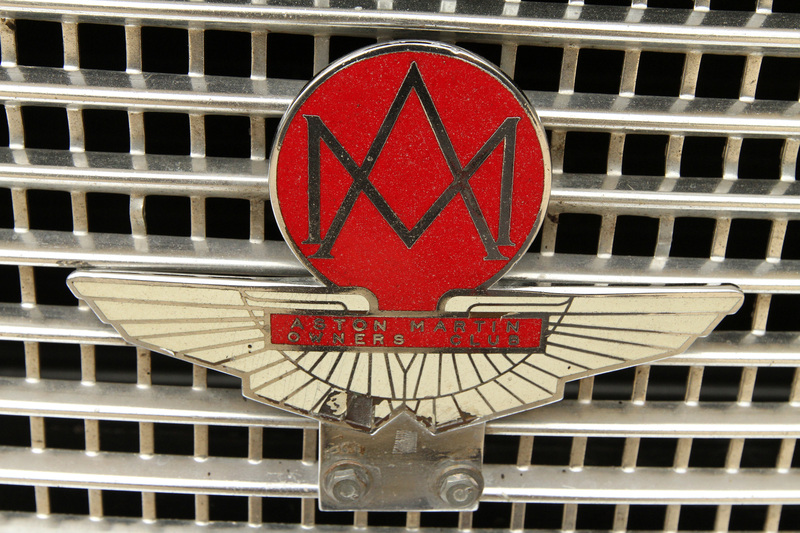 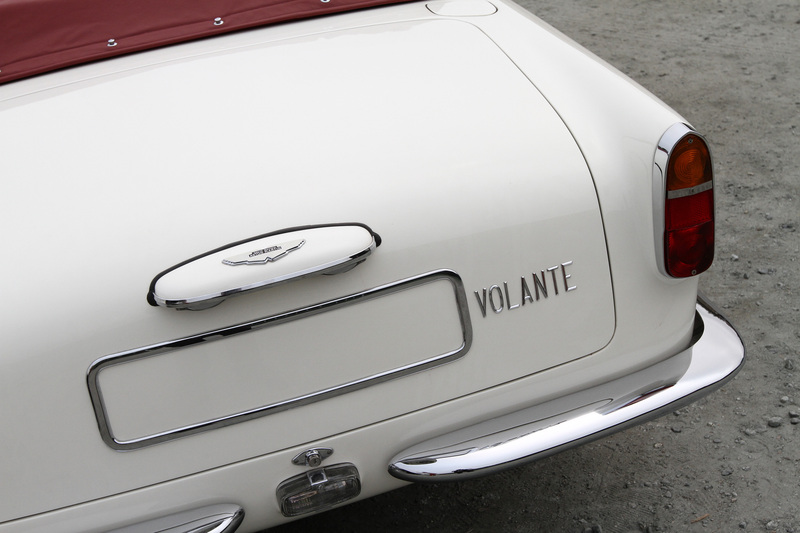 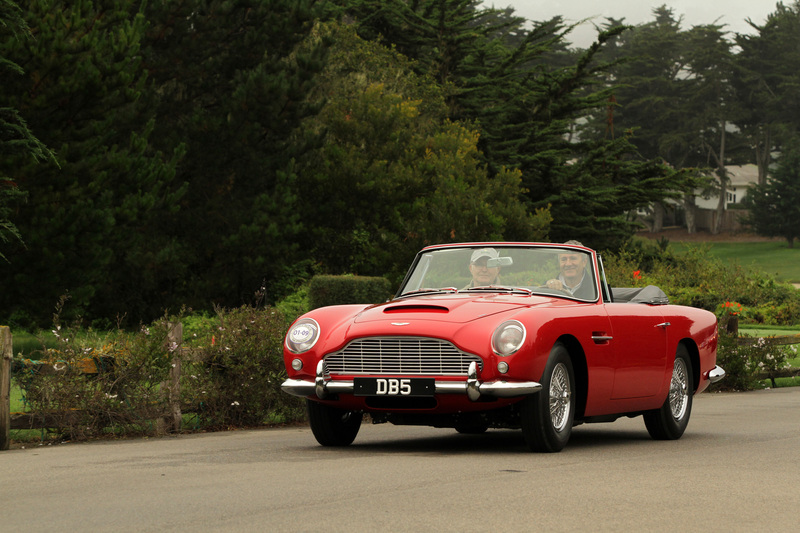 It was the first Aston to adopt the Volante name as used by all subsequent Aston Martin Convertibles. 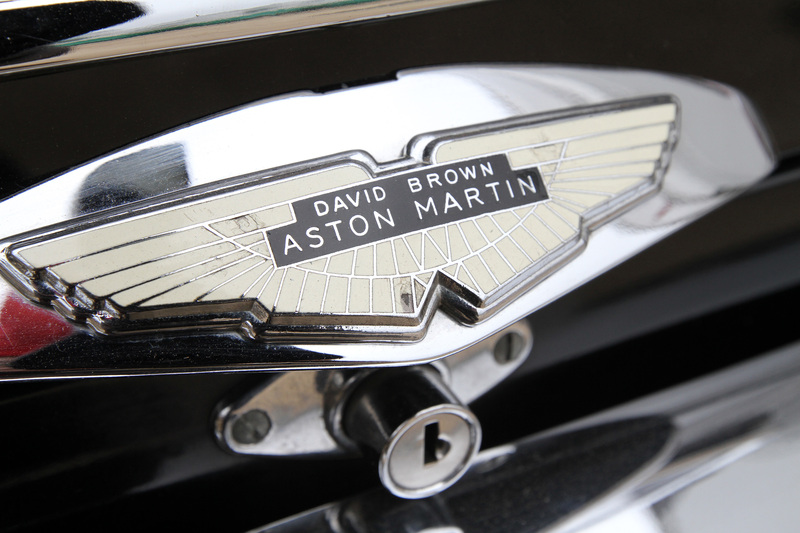 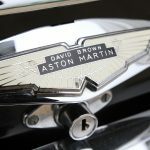 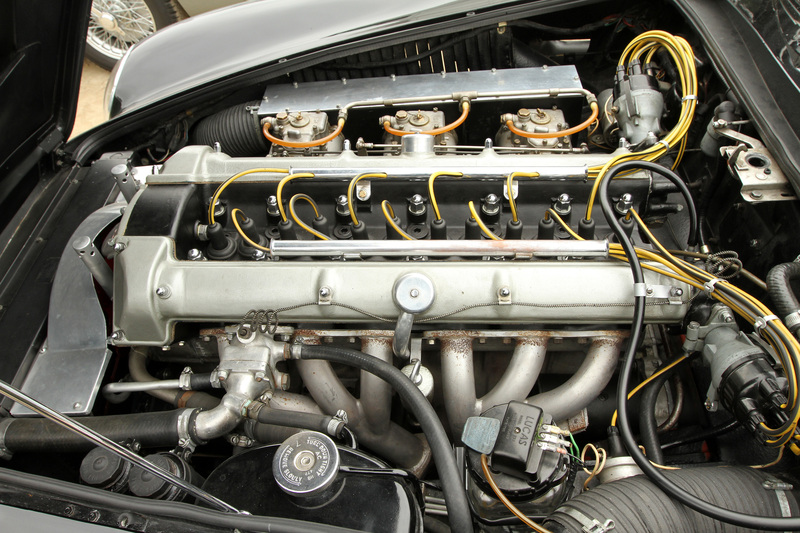 It has a DB5 engine, chassis and suspension, but with several styling features seen on the new DB6, and it is generally considered to be one of the most attractive Astons of the David Brown era. 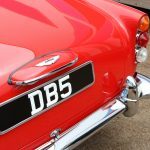 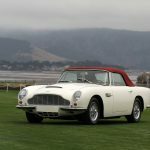 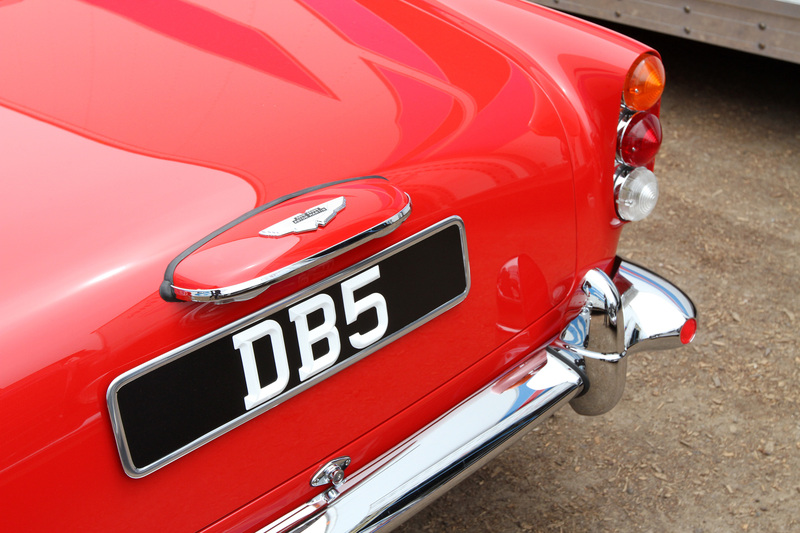 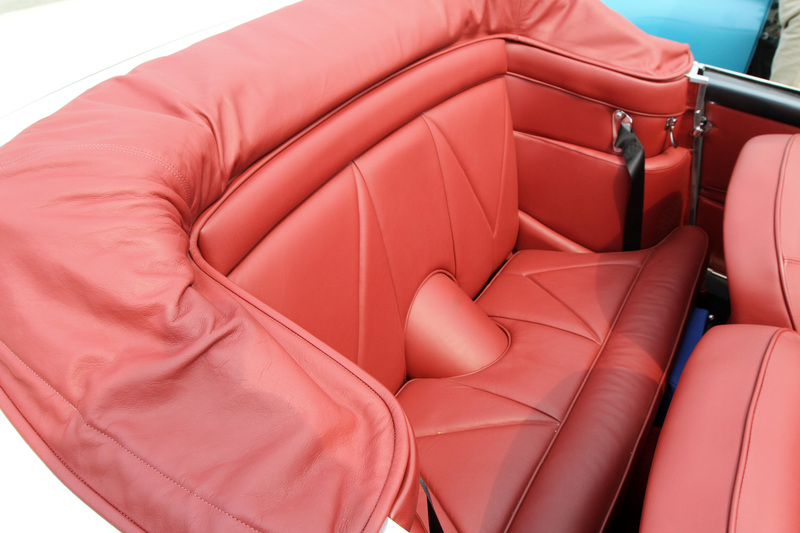 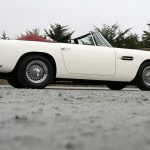 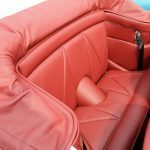 During the single year of production between 1965 and 1966, only 37 Volantes were produced at the Newport Pagnell factory before the introduction of the DB6 Convertible at the 1966 London Motor Show. 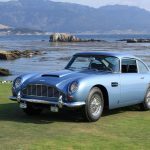 In 2009, this car was fully restored at Aston Martin by a team of technicians that included some people who had originally built the car in 1966! 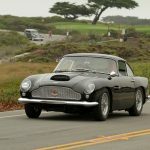 This car (chassis DB4GT/0186/R), the 14th to be built, was the only one delivered to Australia, where it had a short but successful racing career in 1962. 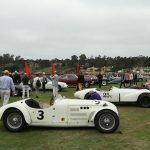 Its first owner, Laurie O’Neill, shared the driving there with Doug Whiteford and Ian Georghegan, and the trio scored many class and overall wins down under. 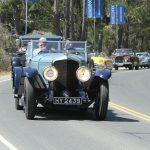 After O’Neill sold the car, it remained in Australia for the next 30 years but was rarely seen. 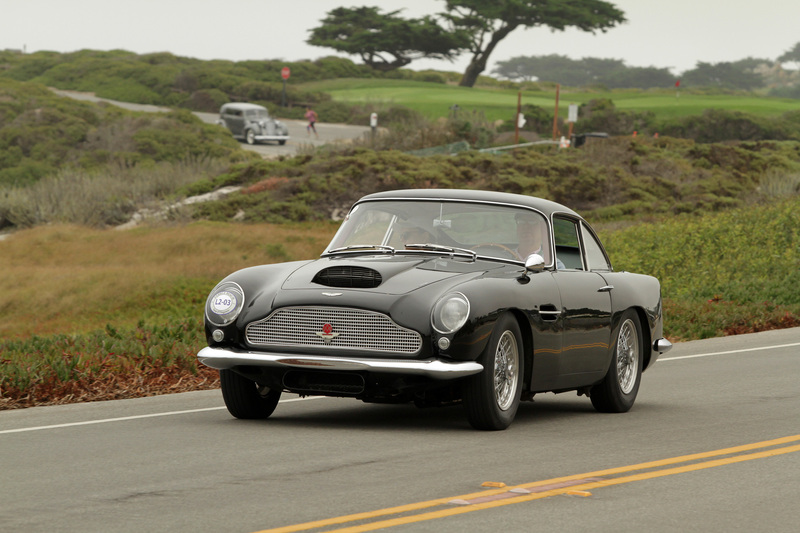 The current owner recently acquired the car from Peter Read, who restored it in 2002.